No one can reasonably deny that developments in medical science – and the consequent improvement in treatment and prevention – have extended our lives, with life expectancy at birth in several western countries now exceeding 80 years. Yet many of these additional years are spent worrying about our health, receiving treatment, and at times making excessive demands on medical science, not only to give us more years but also to improve the quality of our extended life span. The corollary of greater life expectancy is more patient care. As more life years have been added, we have become more treatment conscious, more concerned for our health. A Long Life, the theme of the first edition of our Bologna Medical Science Festival, goes hand in hand with Time to Care. Time, in the sense of the experience of change, a physically measurable but also subjective entity, is an essential factor, or variable, that must be taken into consideration if we are to understand the logic behind the concept of health, both in terms of the risk of falling ill, as well as the judgments and decisions regarding medical procedures and the effectiveness of diagnoses and treatments. This was clearly evidenced in the previous editions, which looked at longevity, individual life cycles, and the way tradition and innovation co-exist in the sphere of scientific and medical practice. For thousands of years, healers and doctors studied how time impacts disease: not, of course, in terms of the time allocated to patient care, but rather the course, outcome and duration of disease in the individual or an epidemic in the general population. The reason for their concern for time was simple: very few effective treatments were available. Medical men of the past were forced to rely on the psychological effect of communication between healer and patient in the hope of inducing some kind of ‘placebo effect’, even if not known as such. The first doctors to refute the idea of illness as a divine punishment understood that, as a natural phenomenon, every disease has its own particular mode of progression, life cycle and development pattern. They therefore took for granted that understanding the natural cycle and progression of disease over time would allow them to intervene in a timely and effective manner. This knowledge only permitted better prognosis, however – although it did give physicians an aura of experience, and hence reliability in the eyes of patients and their relatives! Later on, the scientific approach to medicine led to discovery of the genetic and physiological basis of disease development, how the course of disease varies from one patient to another, and the length of treatment needed to cure curable conditions. Yet by providing doctors with increasingly powerful diagnostic and therapeutic tools, scientific medicine has evidenced a new and different dimension of the time for patient care. For centuries following the breakup of the ancient world and before the scientific breakthrough, physicians would dedicate considerable time and attention to collecting data and impressions regarding their patient’s medical history. Physical examinations were not practised, however. Indeed, during the Middle Ages – with the exception of some western and Arab medical schools – doctors almost never laid their hands on their patients. Differential diagnosis was unknown, there being no classification of diseases or any concept of specific etiology. Practices – aptly known as ‘heroic’ – bloodletting, purging, emetics and surgery – were the order of the day. With the modern era, physicians continued to study their patients in depth, investigating their clinical history. Thanks to the anatomo-clinical approach, they became progressively more accurate in their diagnoses and clinical assessments, systematically conducting physical examinations. They were also adept at differential diagnoses. Despite this, however, effective treatments continued to be few until the 1930s. But with the arrival of the most advanced scientific knowledge and sophisticated technologies, doctors – somewhat paradoxically – started developing an impatient approach, taking little time to establish a patient’s clinical history. They also became cursory in their physical examinations, paying much more attention to laboratory data or diagnostic imaging. In fact, physicians today are now on average better at establishing a differential diagnosis; they have an enormous arsenal of treatment protocols thanks to experimental research and clinical trial standards and a formidable array of drugs and interventional technologies. They have better instruments and greater knowledge … yet they seem to be distancing themselves from their patients, dedicating less time to the person. It could be said in the defence of the medical profession that “it is a waste of time talking with patients and listening to a lot of useless chatter when a diagnosis and subsequent treatment can be arrived at more swiftly and more accurately with objective means”. That would be how Doctor House would justify his attitude. Interestingly though, the physician/patient relationship as part of patient care has been carefully studied in recent years, revealing many surprising facts. A study carried out in 1984 on how a physician’s behaviour influences information collection during a patient’s visit to a doctor’s surgery showed that in only 23% of the visits examined were patients allowed to complete the presentation of the problem that had brought them to the doctor in the first place. In 63% of cases, the doctor had interrupted the patient after about 18 seconds. From then on, in 94% of these interruption explanations, it was the doctor who had then conducted the interview, the patient no longer being allowed to put his/her point of view. Again, in 70% of the cases of interrupted explanations, the doctor had taken for granted that the first problem described was the key issue. 15 years later, a new study showed that doctors interrupted patients after 23.1 seconds. In addition, the negative consequences in terms of the diagnosis arrived at was also measured as a result of patients not being allow time to explain and doctors not encouraging further information. The time factor in patient care presents another interesting aspect in the doctor/patient relationship. In February 1997, an article that was to become historic appeared showing that physicians accused of malpractice had certain characteristics in common, one of them being patient visits of less than 15 minutes. Visit duration, along with irony, was seen to be the predictive variable most frequently linked – especially for surgeons – to the risk of a malpractice claim. The study also evidenced a time threshold that considerably reduced the malpractice complaint risk, especially in the case of internists: an average visit of more than 18.3 minutes. Beyond this threshold no malpractice accusations were found. More than any other variable, patient consultation time most affects doctor/patient communication. And since poor communication has been seen to be associated with medical error and patient dissatisfaction, the time factor also influences the quality of care and its results. The acclaimed Canadian internist, Wendy Levinson, has championed this thesis for more than a decade, conducting empirical sector studies into physician/patient communication, in which the baseline of good communication is ‘active listening’ by the physician. It is a type of listening that takes time. What, however, is the state of affairs on the ground? Although when interviewed, physicians claim they want to spend more time with a patient, a series of perverse incentives oblige them to become operators whose efficiency and productivity are measured against quantity rather than quality parameters, i.e. the number of patients visited in a given time. Time has an ‘ethical’ significance. Quality time, in other words, ‘sufficient time’ to deliver quality professional service is of ethical importance since it allows for effective physician/patient interchange. When the therapeutic relationship is solid, patient autonomy, i.e. patient involvement in the decision-making process and his/her trust in the doctor, improve. In terms of the benefits derived – another ethical dimension of the clinical relationship – we have already seen how the quantity and quality of the time dedicated to patients positively impacts both clinical results and patient satisfaction. In addition, ‘sufficient time’ also improves the ethical quality of the doctor’s decisions in terms of schedule organization, which in turn implies time allocation according to the principle of fairness and justice. Historical and social considerations are currently conveying the message to both patients and physicians that insufficient time is spent with the patient. A closer look should therefore be taken at the ethical implications and how the ‘time’ variable influences the quality of the doctor/patient relationship in order to provide ethically justifiable answers to the current perception that the time factor is unsatisfactorily managed by doctors in their clinical practice. Time to Care. This could also be interpreted as ‘Caring about Time’. Whatever man’s data collection prowess, we risk being diminished as human beings if we do not ensure that the data human intelligence has allowed us to put together are used for the benefit of all. Although the wealth of data now available does not in itself solve the issue of the time available for care faced by doctors and patients, the fact remains that today we have complex integrated data collection and processing systems at the service of doctors, scientific research and complex healthcare organizations. The problem today is rather to link all this with the time to care by simplifying and enhancing the way we provide healthcare. To do this, the whole healthcare system must be involved, especially health system management. These are exciting times for research institutions and the people who work in them, with milestones being reached in incredibly short timeframes. However, this should not make us forget that for many professional operators and ordinary men and women, the time to provide and receive care is often still very lengthy and risks becoming even longer while in other cases in other contexts that time is all too short. I allude rather to those cases where time to care is a reality, providing all-embracing care within expanding timeframes. Although still only for the lucky few, in these instances the future is already here. Today’s tireless targeted research will lead to the development of full-fledged treatment regimes in less than ten years, achieving previously unthinkable goals and bringing the prospect of being able to extend treatment to all those in need. Big Data allow previously unimaginable synergies and swift changes. The problem now is twofold: to ensure these changes become opportunities for pharmaceutical companies to produce successfully, but at the same time, are not rejected but actively embraced by healthcare systems – especially the public healthcare service – with the introduction of organizational innovation. This requires the full commitment of all healthcare operators, especially medical doctors, along with the full backing of institutions as part of their public service duty. Indeed, institutional commitment to a public service duty is a way of avoiding phenomena like the formation of groups that take it upon themselves to spread anti-vaccination propaganda. The enormous quantity of information released every day on the web as a result of biomedical innovation – which thanks to ICT and financial backing currently has more than 7 thousand new drugs in the pipeline – has to be correctly interpreted and put to use quickly and appropriately. them into our digital system. These data are a major outcome and will impact our society in a way still to be assessed and quantified. Assumptions abound. As a consequence, the future is full of unknowns. Research data double every six months. No one can read them all. The expression used is the ‘semantic analysis of unstructured data’. Digital technologies re-design the doctor-patient relationship. Smart, across-the-board processing of Big Data paves the way for personalized medicine. Healthcare professionals are developing new ways of working. Robotics and its attendant workers, biomedical engineering and physics have all in recent years profoundly impacted the most innovative sectors of the pharmaceutical industry and today dictate the ‘time to care’. The electronic processing of all healthcare data, from hospitals to individual patients, means that broadly trained operators are confronted with a mass of molecular data whose management requires the involvement of the medical community, from researchers to healthcare management. All players must be made aware of the importance of being part of the on-going experimentation and its relevance for patient treatment. Yet the time issue, especially the question of time to care at the individual level, remains decisive and often neglected. The Festival has on several occasions looked at the question of the delicate relationship between doctor and patient. This year, it will also consider the psychology of medical decisions and their effect on patients. From the considerations given above it is evident that tools like Big Data and the technological platforms able to put this wealth of information to good use have the ability to produce rapid analyses and action. As a result, the question of the doctor-patient relationship comes to the fore once more, taking on a much greater significance than even a few years ago. From the United States we hear of doctors’ visits lasting 15 to 18 minutes – less than the time spent at the barber’s, despite the fact that the doctor-patient relationship must be built on continuity and trust. The Festival looks at these questions in a constructive way since the Italian healthcare system, albeit not always and not everywhere, today deserves our applause. There are, admittedly, issues of fragmentation, but these are being dealt with successfully in many areas. Research and development in the field of artificial intelligence and telemedicine will also be on the Festival’s agenda, looking at how best to use data to improve healthcare delivery. How can the values of empathy and a sense of trust be restored to doctor-patient relations, allowing the doctor to once again be a mediator between patients and their illness? What does including the Medical Humanities once more into medical practice actually mean? How does this play out in a context where the doctor-patient relationship is superficial and often without any plausible follow-through, and where suspicion on the part of patients and their families – often supported by the legal profession – further undermines the relationship? The human body wonder told by playing and drawing. 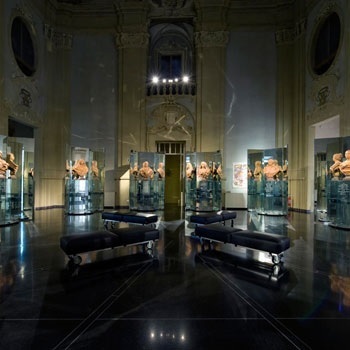 The splendour of the Teatro Anatomico, one of the treasures of Bologna, open to families. Guided tours among historic buildings and the university life of the past. A bioethics court for secondary school students as jurors. It is the appointment with “Geniuses aboard” for future medical jobs. Music and theatrical action to observe Medicine and its protagonists from less usual points of view. An attempt to contaminate discourse types by adapting translation styles, trying to make richness of the philosophical-medical thought emerge on stage. After China and Germany, the guest country of the 2018 Festival della Scienza Medica is Mexico. Mexico is a country with a great tradition in cardiovascular research, whose participation will allow to confirm the Festival’s interest in confrontation with medical cultures and operational models other than those of which we are protagonists and/or beneficiaries. Some hospital beds and patients, the same disease but different diagnoses and therapies in different periods. A format between a conference and a theatrical play: the public follow the “consultant” – like in hospitals during morning “ward visits” – who asks questions to patients/actors reciting medical records of the time. The advances of medicine along the ward of history with old and new patients. Four in-depth analyses of social and biomedical current events, four appointments about the same number of topics, three related to rules and regulations and a transversal one on the advances of medicine: Innovation and technology; Oncology; Neurosciences; Internal Medicine. An attempt to better define the boundaries of the different subjects and, at the same time, plumb their complexity levels and possible interactions. We are living a new age, where the boundary of subjects is less clear. Innovation is asking medicine to face languages and research and teaching fields that draw the horizon of possible future developments: aesthetics and moral philosophy, information technology and computer science, and telecommunications as well as the languages of art and film and television fiction. Like any science, medicine is continuously and positively evolving and discoveries that were innovation yesterday, today are a platform on which future knowledge can be built. The scheduled conferences offer an overview on some recent developments of biochemical research – and other apparently distant subjects such as information technology and telecommunications – drawing the next horizon of medicine and the future doctor-patient relationship. Magisterial lectures following the footsteps of the great clinicians and academicians of the Alma Mater and the first modern school of medicine in the University history. A series of conferences promoted and organized by bodies, institutions, companies and industry organizations. Prof. Luis Alcocer is a Cardiologist, Master in Public Health, General Director of the Mexican Institute of Cardiovascular Health and President of the Inter-American Society of Hypertension. He was for 40 years Head of the Cardiology Service of the General Hospital of Mexico and Professor of Medicine (Cardiology) of the National Autonomous University of Mexico. Past president of the Latin-American Society of Hypertension and the Inter-American Society for Clinical Pharmacology, he has published more than 250 papers in international medical journals and he is author of 12 books of Hypertension, Lipids, Pharmacology Economics, Electrocardiography and Cardiology. International lecturer in Cardiology, Hypertension, Lipids, Economics, Behavioral Cardiology, etc. Mattia Altini graduated in Medicine and Surgery in 1999, qualified as quality systems inspector in the health field (third part) in 2000 and attended the training course in Evidence Based Medicine. In 2004, he obtained a Specialization degree in Hygiene and Preventive Medicine and in 2008 completed a research doctorate in Occupational Medicine and Public Health. He carried out research activities at the Harvard Business School, USA and worked as advisor at the Joint Commission International, Chicago, USA. He is Associate Editor of the Journal of Medicine & The Person. He is also Medical Director at IRST. Sergio Amarri is a physician specialized in Paediatrics and Gastroenterology and Digestive Endoscopy and Director of the Paediatrics Hospital Unit at the Local Health Unit of Reggio Emilia. Giuseppe Ambrosio is Full Professor of Cardiology at the Department of Medicine of the University of Perugia and Director of the Complex Unit of Cardiology and Cardiovascular Physiopathology of the University Hospital of Perugia. He was Medical Director of the University Hospital of Perugia from 2009 to 2013. He has been Visiting Professor at the Ohio State University and the Johns Hopkins University; he is also Full Professor at the University of Buenos Aires. Sergio Baldari is full professor of Nuclear Medicine at the University of Messina and Director of the Specialty School for Nuclear Medicine. He is also Director of the Complex Operative Unite of Nuclear Medicine of the Messina University Hospital, where diagnostic (scintigraphy and PET) and therapeutic procedures are performed, also in shielded treatment rooms. He is author of several scientific publications and book chapters on topics related to Nuclear Medicine therapy, as Head of the AIMN Centre of Excellence for training in Diagnostic and Therapy of neuroendocrine tumours. He is involved in clinical research projects on nuclear medicine therapy. Giovanni Barbara is a surgeon specialized in Internal Medicine and Gastroenterology and professor at the University of Bologna. He studied in Bologna and London and took up a three-year research fellowship from the McMaster University in Canada. His main field of interest is clinical and molecular research on gastrointestinal functional and organic disorders and neurogastroenterology of the intestinal microbiota and intestinal inflammatory diseases He mainly collaborates with universities in Italy and abroad and is the author of over 300 articles published in major international journals as well as of 50 book chapters and essays. Professor Barbara has received several international awards and prizes, including the Master Award in Gastroenterology from the American Gastroenterological Association. Currently, he is member of the Board of Directors of the Rome Foundation and Chairman of the European Society of Neurogastroenterology and Motility (ESNM). Gabriele Beccaria is a scientific journalist and editor of Tuttoscienze, the weekly science and medicine supplement of the newspaper La Stampa. Graduate in history from the University of Turin, he holds a master of science in journalism from the Boston University and a Leadership Seminar from the Georgetown University of Washington. He works with science and the most controversial issues related to the relationship between science and society. He is co-author of two eBooks: Scienza e Democrazia with Andrea Grignolio and Prima che Accada with Francesco Vaccarino. Renza Barbon Galluppi is Honorary President of UNIAMO F.I.M.R. onlus and project responsible at UNIAMO GOLDIN I.S. (spin-off of UNIAMO F.I.M.R. onlus). EURORDIS award winner for her career. She was member of the Ministerial Scientific Committee for Experimentation pursuant to art. 1 of the Ministerial Decree dated 18 June 2013 appointed by Ministerial Decree dated 28 June 2013. She is a fervent supporter of empowerment and creator of the S.S.R.D. (Season School Rare Disease), a season training school on rare diseases for the development of skills aimed at making aware choices. Giuliano Barigazzi is Counsellor responsible for health and welfare of the Municipality of Bologna. He graduated with honours in Philosophy from the University of Bologna and in 1993 was elected Mayor of San Pietro in Casale for two consecutive terms and Chairman of the Board of Auditors of the Bologna Nord Local Health Unit. From 2004 to 2013, he held the office of Councillor responsible for Health, Social Services and Voluntary Services of the Province of Bologna, President of the Socio-Sanitary Territorial Conference and the Joint Committee for Voluntary Services and was member of the regional Control Room for social and health policies. From 2009 to 2013, he was also in charge of Culture. From October 2013 to June 2016, he held the office of Staff Head for the Mayor of Bologna. Fabrizio Benedetti is Director of the Center for Hypoxia, Plateau Rosà (Switzerland) and Professor of Neurophysiology at the University of Turin. He is author of The Patient’s Brain (Oxford 2010) and Placebo Effects (Oxford 2014), both translated in Italian. Arnaldo Benini is Emeritus Professor of Neurosurgery at University of Zurich. Among his recent publications: Che cosa sono io? Il cervello alla ricerca di sé stesso (Garzanti, 2009); La coscienza imperfetta. Le neuroscienze e il significato della vita (Garzanti, 2012); and with Giorgio Vallortigara, Cervelli divisi. Solo gli esseri umani contano da sinistra a destra? (Accademia di Architettura Mendrisio, 2014). On February, 2017 was published his book Neurobiologia del tempo (Cortina Editore). Translation of Paul Thagard’s Il cervello e il senso della vita (Mondadori, 2014). Collaborator of the Sunday Cultural Supplement of SOLE24ORE for science subjects. Luigi Bolondi is Internal Medicine Ordinary Professor at the University of Bologna, he was the President of the Medicine and Surgery School of the same University; he is also the Director of the Internal Medicine Operative Unit of the S. Orsola Hospital in Bologna and of the Specialization School of Internal Medicine. He is the author of 6 monographs, 3 of which are international, regarding epatology and diagnostic imaging. He published over 350 articles in international periodicals reviewed by Science Citation Index. Alessandro Bonfiglioli is General Manager of CAAB and Secretary-General of the Fico Foundation. He is a professional accountant and auditor. Since 2009, he is professor of Industrial Design and Branding – International MBA and Made in Italy at BBS and since 2015 Scientific Co-director of the Executive Master in Entrepreneurship. Job experiences: Gruppo Castelli – Haworth: administration and finance manage, CFO Europa, General Manager and Managing Director for Italy. Gruppo Alessi: Group CEO and Vice-chairman of foreign subsidiaries. He graduated in Econometrics with honours and obtained an MBA from the University of Bologna. He also specialized from CIDE Genève, Harvard Business School USA and IGDS Zürich. Claudio Borghi is Professor of Medicine at the University of Bologna since 2005, and Director of the Medicine Operative Unit of the general hospital S. Orsola-Malpighi of Bologna; he is also Director of the Specialisation School of Emergency Medicine and President of the Società Medica-Chirurgica of Bologna. He is also Member of the Scientific Council of the International Society of Hypertension. Dario Bressanini is Assistant Professor at the Department of Science and High Technology of the University of Insubria (Como). He is holder of the section “Pentole e provette” on the review Le Scienze, concerning the scientific exploration of food. He published Pane e Bugie (Chiarelettere), Le bugie nel carrello (Chiarelettere) and Contronatura (Rizzoli) with Beatrice Mautino. He is the author of the popular blog “Scienza in Cucina”. Gabriele Bronzetti is cardiologist at the general hospital S.Orsola-Malpighi in Bologna. He deals in particular with congenital and developmental heart disease. He teaches cardiology and arrhythmology at national and international master courses and courses. He has written a large number of scientific publications and two cardiology books, one of which with a worldwide reach (Atlas of Paediatric and Youth ECG”, Springer int.). He has written the play “Figlia di un Dia minore” and collaborates with the Bologna edition of the Corriere della Sera as leader writer and author of a week column on medicine. He deals with narrative medicine. Enrico M. Bucci is an Italian researcher who works in the field of biomedical Big Data analysis and scientific research integrity, a sector in which he has become famous for his work as advisor in several high profile cases in the US, Germany, UK and Italy. Since 2017, he has been working as advisor for the Commission on Research Ethics and Bioethics. Since the same year, he is responsible for training courses of Research Integrity at the IMT School of Lucca and advisor of the same subject for the FLI Institut of Jena (Germany). At the end of 2017, he was awarded the “2017 National Italian American Foundation – Giovan Giacomo Giordano Foundation Lifetime Achievement Award for Ethics and Creativity in Medical Research” for his work. As a consultant, he has worked and still works for several scientific journals examining all papers submitted for peer review to identify cases of possible manipulation of images or data. His work has been described in several national and international media, including “Nature” and RAI. Physician, Full Professor of Microbiology and Virology at the Faculty of Medicine of Università Vita-Salute San Raffaele of Milan, Doctor of Microbiological Sciences, Specialist in Clinical Immunology and Allergology, he works as director of a laboratory of immunological research that studies the immune response to human pathogens and the development of new immunologicals. He has published scientific papers on infectious diseases and microbiology in prestigious scientific journals. In 2016, he published the popular work “Il vaccino non è un’opinione” with Mondadori and in 2017 “La congiura dei somari” with Rizzoli. Giorgio Cantelli Forti is Professor Emeritus at the Alma Mater Studiorum-University of Bologna, past-President of the Società Italiana di Farmacologia (SIF) and Chairman of the Accademia Nazionale di Agricoltura. His scientific activity as pharmacologist is documented by over 680 publications, 265 of which full texts in international journals with over 4600 quotations, 39 book chapters, 53 conference proceedings, 16 short communications and 324 communications to national and international conferences. Andrea Capocci (Rome, 1973) is a physicist and scientific populariser. After working at the university “La Sapienza” of Rome and the University of Freiburg, he writes articles for the newspaper “Il Manifesto” and teaches at a secondary school in Rome. He is the author of some books, including “Networkology” (il Saggiatore, 2011) and “Il brevetto” (Ediesse, 2012). Roberto Caso is Associate Professor of Comparative Private Law at the Faculty of Law of the University of Trento and co-director of the LawTech Team. He teaches Civil Law, Intellectual Property Comparative Law, IT Private Law, Privacy Comparative Law and Art and Copyright. He is author or editor of many books and articles on Intellectual Property, Privacy Law and Protection of Personal Data, Agreement Law and Civil Liability. He is Chairman of the Italian Association for the Promotion of Open Science and associate member of the Centre for Intellectual Property Policy (CIPP) at the McGill University, Faculty of Law (Montréal). Michele Cassetta graduated in Medicine and Surgery and works in private practice in Bologna. He deals also with communication in parallel with his medical profession. He is a scientific populariser and journalist, as well as short-term lecturer of “Doctor-Patient Communication” at the Faculty of Medicine and Surgery of the University of Bologna. He is also a speaker at national courses and conferences and author of books, articles and theatrical texts on communication. Finally, he is the host of the radio and television health information broadcasts “InSalute” and “Salutando”. Andrea Castagnetti graduated in Cell and Molecular Biology from the Alma Mater Studiorum – University di Bologna in 2010, after spending the thesis period at the Lion Eye Institute of Perth (Australia). In 2014, he obtained a research doctorate in Molecular Biotechnology from the University of Siena, carrying out research at the Research Centre of Novartis Vaccines Srl in Siena. From 2015 to 2016, he was the holder of a research grant at the Unit of Microbial Ecology of the Department of Pharmacy and Biotechnology of the Alma Mater Studiorum – University of Bologna and, during this period, was the co-founder of Wellmicro Srl, recognized as an innovative startup and spinoff of the University of Bologna working in the field of human and animal microbiota. Since 2017, he holds the office of Chairman and Managing Director of Wellmicro Srl. Marco Ceriani graduated in Science and Alimentary Technology. He established a company for the development and production of food supplements for sports (Officina Alimentare 1994-2004) and Italbugs, a start-up of the 2015 Parco Tecnologico Padano of Lodi at Milan Expo 2015. Today, Italbugs has a registered office in Holland (Wageningen) for the production of novel food from food matrices deriving from edible insects. (www.myxdutch.com). Marco Ceriani is member of the Novel Food Commission of IPIFF (International Platform of Insects for Food and Feed), journalist and writer. In 2014, he published the book “Si fa presto a dire insetto”, today at its third edition. Arrigo F.G. Cicero, Department of Medical and Surgical Sciences at the University of Bologna. Doctor, graduate of nutrition and geriatric therapy at the University of Paris, Internal Medicine Researcher, President of the Italian Nutraceutical society, Author of more than 300 publications on international periodicals (N Engl J Med. 2016;374:591-2, Pharmacol Res. 2016;107:234-42). Chiara Cirelli studied medicine at the University of Pisa and took a PhD in Neuroscience from Scuola Superiore S. Anna di Pisa. She studied the functions of sleep at the Institute of Neuroscience in San Diego, California at first and then at the University of Wisconsin, Madison, where she currently teaches neurophysiology of sleep and conducts experiments on animal models and humans to explain the essential role of sleep in the brain functioning. Her laboratory has been the first to use molecular screening methods to identify important genes in sleep regulation. Together with Giulio Tononi, she has developed the hypothesis of synaptic homeostasis according to which sleep is the price to be paid for allowing the brain to remain plastic and learn during waking. In 2017, with Giulio Tononi, she was awarded the Farrell prize by the University of Harvard for their contribution to the study of sleep. In 2018, she received the Outstanding Scientific Achievement Award from the American Society of Sleep Medicine. Franco Citterio is Professor of General Surgery and Director of the Kidney Transplant Unit of the Università Cattolica del Sacro Cuore, Fondazione Policlinico Universitario A.Gemelli IRCCS, Rome. He developed an interest in immunosuppression and kidney transplantation during a clinical and research Fellowship in organ transplantation at the University of Texas in Houston, USA. His clinical work and research are focused on the immunological aspects of kidney transplantation and the design and realization of clinical trials in the field of immunosuppressive protocols in kidney transplantation. The results of his activity are published in journals and presented at national and international conferences. Professor Citterio has been Chairman of the Italian Society for Organ Transplants (SITO, 2014-2016) and now is Chairman of the Italian Foundation for the Promotion of Organ Transplants (FIPTO). Lucio Ildebrando Maria Cocco is Professor of Human Anatomy at the University of Chieti since 1986, and Professor of the same discipline at the University of Bologna since 1990. He was awarded with “The titular Litchfield Lectureship 2016-2017” by the Oxford University and with the “Journal of Lipid Research Lecturership 2016” by the Federation of American Societies for Experimental Biology/American Society for Biochemistry and Molecular Biology . He is the Director of the Laboratorio di Trasduzione del Segnale at the Department of Biomedical sciences at the University of Bologna and he is Editor-in-Chief of the series “Advances in Biological Regulation” (Elsevier Publ.). Claudio Colaiacomo graduated in physics from the Stevens Institute of Technology. He has been working at Elsevier for many years, where he held several positions. Today, he deals with institutional relations in Italy and Europe, an office aimed at establishing and strengthening collaborations to maximize the impact of universities and research centres on scientific research. Giovanni Emanuele Corazza is a Full Professor and Member of the Board of Directors at the Alma Mater Studiorum-University of Bologna, President of the CINECA consortium, founder of the Marconi Institute for Creativity, Member of the Marconi Society Board of Directors, Member of the Partnership Board of the 5G-PPP. Researcher confirmed as Associate Professor in Internal Medicine since the 2005/2006 Academic Year. Since 1982, he has been operator at the surgery for the study of dysmetabolic diseases and atherosclerosis, of which he became Director under the supervision of Professor Claudio Borghi. From the appointment as researcher, he has been directly connected with the Department of Clinical Medicine and Applied Biotechnology, the Department of Ageing Internal Medicine and Nephrological Diseases later and currently the Department of Medical and Surgical Sciences. He has been in charge of several clinical trials and involved in several research studies. He is member of the Italian Society for the Study of Atherosclerosis, holding the office of Chairman of the Emilia Romagna section, member of the Italian Gerontology and Geriatrics Society and the Italian Society of Hypertension. 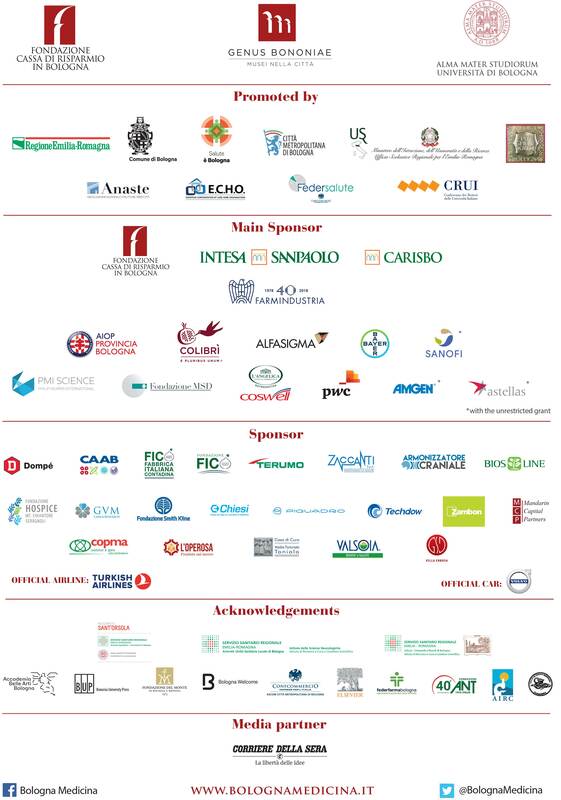 Finally, he is member of the Luso-Italiano de Arteriosclerose Group and of the European Atherosclerosis Society. He has published about 57 works in international journals. Michele De Luca is Full Professor of Biochemistry, Director of the “Stefano Ferrari” Regenerative Medicine Centre and Director of the Centro Interdipartimentale Cellule Staminali and Medicina Rigenerativa of the University of Modena and Reggio Emilia. He is also Scientific Director of Holostem Terapie Avanzate Srl. He is author of over 120 scientific articles published in major international journals and has spoken at more than 200 international conferences and symposiums. Born on 27 June 1962 and living in Naples, Luca De Nicola is specialist in Nephrology and, since 2001, Associate Professor of Nephrology at the University of Campania “Luigi Vanvitelli”. His main area of interest is Chronic Kidney Disease, the subject of his experimental and clinical studies during his Research Doctorate (1988-1992), postdoc (1996-1998) and work as University Researcher (1999-2001). He spent two years (1989-1991) as Visiting Professor at the Nephrology Division – UCSD, San Diego, CA, USA to study glomerular haemodynamics and renal tubular function in rats. He is author of about 200 scientific papers, mainly published in international journals (JCI, Circulation, JACC, JASN, Hypertension, KI, AJKD, cJASN, AJP, NDT) with an H index of 33 and 3700 citations. He coordinated several studies in Italy: TABLE “Target Blood Pressure Levels in CKD”, a multicentre study on cardiorenal risk in patients with kidney disease of 26 Italian nephrology units; CARHES “Cardiovascular Risk in Renal Patients of the Italian Health Examination Survey” in collaboration with the Italian National Institute of Health and the Associazione Nazionale Medici Cardiologi Ospedalieri; two randomized and controlled international trials aimed at assessing the effects of innovative medicines on renal patients. Since 2015, he is member of the Governing Council of the Italian Society of Nephrology. Enrico Di Oto, born in Bologna in 1983, is a biologist with over 15 years of experience in genetic cancer diagnosis and the founder and CEO of OACP; he is also the inventor of the patented technology of the products proposed by OACP to reduce time and cost of genetic cancer diagnosis. He won the first edition of the entrepreneurship programme of the University of Bologna (LaunchPad) and has gained several international recognizances with OACP, both in the USA and China. In 2017, he was selected for the prestigious accelerator RebelBio (Cork-IE), which has given OASP international impetus. I was born in Bologna on 23 July 1971, graduated in Medicine and Surgery in 1996 and specialized in Geriatrics in 2000. I hold two research doctorates in Applied Physiology and Pathophysiology and in Ultrasonology in Internal Medicine. I am a Researcher in Internal Medicine since 2008 and my work is focused on organic failures (in particular, cirrhosis of the liver) and disabilities related to ageing. I am the co-founder and Chairman of Mysurable, a spin-off of the University of Bologna that deals with innovative technologies and services for successful ageing. MSpecialist in Haematology (UnivCatt, Rome), PhD (University of Leuven, Belgium), honorary degree (University of Debrecen (Hungary) and Bialystok (Poland).In 1973, she founded and directed the Thrombosis Lab of the Istituto Mario Negri in Milan. In 1987, she was one of the founders and then Scientific Coordinator of Consorzio Negri Sud. In 2005 (UnivCatt.Campobasso), she launched with Licia Iacoviello and Giovanni de Gaetano the “Moli-sani” population study, which enrolled 25,000 adults to investigate the prevention of chronic degenerative diseases, especially focusing on diet and healthy lifestyles. She is very active at European level both as participant in nutrition and health projects (FAIR, IMMIDIET,FLORA, ATHENA) and as member of the Marie Curie Training Center and evaluator. Currently, she is working at the IRCCS Neuromed, Pozzilli, Department of Epidemiology and Prevention, focusing on the Mediterranean diet, health and the bio-bank that collects samples from the Moli-sani study and other population studies. H-index 82, total citations over 35,000. Julia Downing is director of the International Children’s Palliative Care Network and has a long professional experience in palliative care as professor, researcher and advisor for the development of clinical-healthcare and training projects in Africa and Eastern Europe. She is member of the management boards of non-governmental organizations in several countries and professor at the Kings College of London, the Edge Hill University of Liverpool and the University of South Wales. Stefano Faenza was born in Bologna on 03/04/1948. He has been working as University employee, at first as Assistant then as Associate Professor, until reaching his actual office of Full Professor. His field of expertise has always been anaesthesia and resuscitation, especially with reference to solid organ transplants. He is author of 220 publications, 20 book chapters and a lecture notes for students. Gianluca Faggioli graduated in Medicine and Surgery and specialized in Vascular Surgery from the University of Bologna, with honours. He is a Doctor of Cardiothoracic-Vascular Surgery” (1994). He worked as Vascular Surgery consultant at Istituti Ortopedici Rizzoli in Bologna in 1994 and as 1st level Vascular Surgery Medical Director at Ospedale Maggiore in Bologna from 1996 to 1998. In 1998, he became University Researcher at the University of Bologna and, since 2006 he has been Associate Professor of Vascular Surgery at the same university. Since March 2017, he has been working as Director of the Specialization School for Vascular Surgery. He carries out his clinical, surgical, educational and research activity at the Policlinico S.Orsola Malpighi. He is author of over 300 publications in international journals and 3 monographs. Chiara lives in Amsterdam, where she works at Elsevier. She graduated from the university La Sapienza of Rome and took her research doctorate in physics. As publisher, she deals with the management of a group of prestigious journals specialized in high-energy physics. Franco Farinelli is Head of the Department of Philosophy and Communication of the University of Bologna. Previously, he taught at the universities of Geneva, Los Angeles (UCLA), Berkeley and the Sorbonne and the École normale supérieure in Paris. His last book is Coscienza Urbana. Saggio di geografia politica, which will be published by Einaudi. Giovanni Maria Flick is an Italian jurist, politician and academician. After graduating in Law at 23, he was at the head of the Città dei Ragazzi in Rome. At 24, he passed the competition to become a magistrate, taking the first place at national level. In 1976, he left the magistracy and began his career as a criminal lawyer, interrupted in 1996 with the appointment as Minister of Justice in the first Prodi’s government. In February 2000, he was appointed Judge at the Constitutional Court by the President of the Italian Republic, Carlo Azeglio Ciampi. Five years later, he assumed office as Vice-chairman and in 2008 as Chairman. Currently, he is Professor Emeritus in Criminal Law at the Luiss University of Rome, where he taught until his appointment as Constitutional Judge. He was advisor and then chairman of the Fondazione San Raffaele del Monte Tabor during the composition with creditors that allowed to save and sell the Milan health and research centre. Andrea Fontanella graduated in Medicine and Surgery from the University of Naples and specialized in Laboratory Semiotics and Diagnostics, Cardiology and Internal Medicine. Since 2005, he is Head of the Medicine Department at the Ospedale Madonna del Buonconsiglio Fatebenefratelli in Naples, on which the Internal Medicine, Casualty, Cardiology, Oncology and Hepatology Departments depend. He is Chairman of FADOI (the Italian Federation of Associations of Hospital Doctors on Internal Medicine). He is author of over 190 publications in national and international journals. He has been speaker and/or chairman at over 550 local, national and international conferences. One of the world’s major trumpeters, prolific jazz artist Paolo Fresu has recorded more than 350 titles since the 1980s. Born in 1961 in Sardinia, Italy, Fresu learned the trumpet at the age of 11 and later studied the instrument at the Cagliari Conservatory. Upon his graduation in 1984, he quickly accumulated awards, with accolades from France’s l’Académie du Jazz and a Django d’Or. With a sound reminiscent of 1950s era Miles Davis, Fresu has created a style all his own, mastering with a natural ease any genre, from straight jazz to fusion. Between recordings and shows, Fresu also serves as artistic director for the Berchidda Time in Jazz Festival, his hometown’s jazz festival. He is also involved in the production of numerous multimedia projects, cooperating with actors, dancers, painters, sculptors, and poets, as well as writing music for film, documentary, video, ballet, and theater pieces. Mr. Fresu lives between Paris, Bologna and Sardinia. His unique trumpet sound is recognized as one of the most distinctive in the contemporary jazz scene. Marina Chiara Garassino is currently Head of the Thoracic Pulmonary Medical Oncology Unit at the Fondazione IRCCS Istituto Nazionale dei Tumori of Milan. She graduated in 1995 and specialized in Medical Oncology in 2000 with honours from the University of Milan. She worked in Manchester at the Christiès Hospital, one of the major cancer centres in Europe, with a European scholarship. She has been working for years in the cure and treatment of thoracic neoplasia, in particular in the molecular characterisation of pulmonary neoplasia with reference to treatments and the development of immunotherapeutic treatments. She has been awarded several national and international grants. She is also Principal Investigator of several national and international clinical trials. She was the Italian member of the European Society for Medical Oncology (ESMO). She is member of several ESMO commissions and task forces. Currently, she is chairwoman of Women for Oncology. She is author of several publications in international journals and has been awarded several international prizes for research. Paolo Giacomin is editor of the newspapers Quotidiano Nazionale and Resto del Carlino and of the online newspapers Quotidiano.net and ilrestodelcarlino.it. He is a journalist specialised in economics and finance and has been working with online news since 1999, when he joined the first online desk of the Poligrafici Editoriale group. In 2011, with Stefano Righi and Massimo Degli Esposti he published the book “Dieci anni con l’euro in tasca – Conversazione con Romano Prodi e Jacques Delors”. Enrica Giorgetti, with a degree in Law from the University of Bologna, is General Manager of Farmindustria since July 2005. She is currently member of the EFPIA (European Federation of Pharmaceutical Industries and Associations) Board and the IFPMA (International Federation of Pharmaceutical Manufacturers & Associations) Board. She started her career in 1983 in the field of institutional relations, holding offices of increasing responsibility. At first at Montedison from 1983 to 1987, therefore at S.I.V. – Società Italiana Vetro until 1989 and then at Federchimica as Manager of Relations with National and EU Legislative Institutions until 2000. From 2000 to 2003, she worked at Confindustria as Lobby and Legislation Activity Manager and, afterwards, as Manager of the Territory and Business Strategic Area. In the same period, she represented Confindustria in the CONAI Board of Directors. From 2004 to 2005, she held the office of Manager of Institutional Relations and Communication for the company Autostrade. In 2007, she was awarded the “Mela d’oro” prize by Fondazione Marisa Bellisario at the 19th edition of “Donne nella comunicazione: valore e trasparenza”. In 2017, she was recognized for “her commitment as a woman for women” by IncontraDonna Onlus. Luigi Godi graduated in Medicine and Surgery from the La Sapienza University of Rome and has spent the first 30 years of his career in the field of pharmaceutical research, collaborating in planning and organizing clinical trials in the different stages of development of pharmaceutical products; at Philip Morris since 2016, he deals with scientific projects for Reduced-Risk Products; he is also Lecturer at the Faculty of Pharmacy of the Tor Vergata University of Rome, where he teaches “CRO Business management”. He is author of over 40 publications. Rita Golfieri is Director of the Operative Unit of Radiology at the Azienda Ospedaliero-Universitaria of Bologna, and Director of the Department of Diagnostics Medicine and Prevention of Bologna. She has been Professor on contract since 1984 at many specialisation schools; in 2012 she obtained the scientific qualification for University Professor in Medical imaging, Radiotherapy and Neuroradiology. She collaborates with many research projects in the field of interventionist radiology and advanced diagnostics in radiology. She is an active member of several scientific societies, and reviewer for several scientific journals. She has taken part in over 300 national and international conferences and courses. She is author of over 700 publications, with an Impact Factor of over 900 and an H-index of 31 (source: Scopus). Ordinary Professor of Toxicology at the Alma Mater Studiorum, University of Bologna, President of the Italian Society of Toxicology, where she is involved in fighting against counterfeiting of medicines and health products and in promoting food safety. She is the author of more than 180 works concerning preventive and translational medicine. Silvana Hrelia is Full Professor of Biochemistry at the Scuola di Farmacia, Biotecnologie e Scienze Motorie of the University of Bologna. She is author of over 160 articles on topics of cell biochemistry and nutrition published in international journals. She is member of the Key Thrust: “Improving health, wellbeing and longevity” of the European technological platform “Food for Life”. Since May 2014, he is Chairman of Fondazione Toscana Life Sciences of Siena and member of the Steering Committee of Distretto Life Sciences della Toscana. Florence for the enhancement of research results and management of the university incubator. Firenze and acts as Business Angel for several Italian and foreign start-ups. He collaborated and still collaborates with several university and post-university courses of important Italian universities in the field of biomedical engineering, health and company management. He is currently member of Fondazione Italia Cina as Delegate of Regione Toscana and collaborates with the journal Mondo Cinese. Robert Lefkowitz (New York, 15 April 1943) is a physician from the US and the winner of the Nobel Prize for chemistry in 2012, together with Brian Kobilka, for their G-protein-coupled receptors work. After graduating in Medicine from Columbia University (1966), he completed his education at Harward University and, starting from the ‘70s, taught Biochemistry at Duke University. There, Lefkowitz started dealing with research. His studies focused on the perception of external stimuli by cells: by bringing particles in contact with some hormones bound to radioactive atoms, Lefkowitz discovered receptors that recognize the hormones. This way, he was able to analyse and examine the structure and the functioning of the receptors pairing off with human G proteins: besides allowing the analysis of mechanisms at the basis of the action of adrenaline, these receptors are at the basis of most medicinal products in use. Given Lefkowitz’s contribution to the development of the most effective medicines, in 2012 the Swedish Academy of Sciences conferred him and his colleague and student Brian Kobilka the Chemistry Nobel Prize. Paolo Legrenzi is an Italian psychologist and academician internationally known in the field of cognitive psychology. He is a member of the Istituto Veneto di Scienze, Lettere ed Arti, the Association for Psychological Science, the Associazione il Mulino (chairman of the Editorial Board since 2012). He is Professor Emeritus in cognitive psychology at Università Ca’ Foscari of Venice and Chairman of the Scientific Committee of the Ca’ Foscari Competency Centre. He is also Chairman of LUISS X.ITE. Over the years, he has written for tipi di Laterza, il Mulino and Raffaello Cortina and for the newspapers Gazzettino, Repubblica, Sole24Ore. In 2017, together with Carlo Umiltà, he was awarded the Sante de Sanctis Prize for the essay “Una cosa alla volta” (Mulino). He is a member of the CNR Research Ethics and Bioethics Committee. Giorgio Li Calzi is a composer, trumpet player and music producer. He has made 11 albums. He has played and recorded with several international musicians: Lenine, Thomas Leer, Mamady Koyatè, Elena Roggero and Tiziana Ghiglioni. He has an intense live activity related to theatre, adding trumpet and computer soundtrack, reading and works with many authors. He experiments new forms of electroacoustic sound related to the trumpet. The City of Turin appointed him as director of the Torino Jazz Festival in 2018. Antonio Lovato has collaborated with many actors and musicians of the Italian theatrical and music scene and with the most important international music, theatre and dance festivals: Leo de Berardinis, Sandro Lombardi and Federico Tiezzi, Massimo Venturiello, Tiziana Tosca Donati, Maurizio Crozza, Enzo Iacchetti, Giobbe Covatta, David Riondino, Umbria Jazz, Porretta Soul Festival, Pescara Jazz, Festival del Cinema Ritrovato and Mittelfest. Donata Luiselli is associate full professor at the University of Bologna (05/B1-BIO/08) since 2005 and works in the field of molecular anthropology and genomics of human populations. In particular, her research interests are focused on the genomic study of the current human biodiversity, archaeogenetics, the genetic and epigenetic analysis of populations and the analysis of genes subject to selection pressure (e.g. involved in temperature control and nutrition processes). In her work, she collaborates with colleagues of other subjects (forensic genetics, linguistics, archaeology, cultural anthropology, and medicine), stating the importance of the human evolution approach in the different investigation fields and preferring a multidisciplinary approach. She is involved in national and international research projects and collaborates with several national and international universities and research centres. Nicoletta Luppi, Chairwoman and Managing Director of MSD Italia, graduated in Foreign Modern Languages and Literatures with honours and, later, obtained a Master in Business Administration from the Luiss School of Management of Rome. In 1993, she joined MSD and, over time, held offices of increasing responsibility until reaching the direction of the Cardiovascular-Metabolic Business Unit of MSD and Schering Plough, as well as two group companies (2003 -2010) and, in 2011, created and was at the head of the Market Access & Commercial Operations Direction, always reporting to the Managing Director. In September 2012, she became Chairwoman and Managing Director of Sanofi Pasteur MSD and, afterwards, she was appointed as Chairwoman of the Vaccine Group of Farmindustria for the two-year period 2015-2016. Since July 2015, she is Chairwoman and Managing Director of MSD Italia and, since 2016, Chairwoman of the LUISS Business School Alumni Association. In March 2017, she was chosen by AMREF as testimonial for the Social Campaign against female genital mutilation. In the same year, she was awarded the “Premio Minerva-Donna D’Eccellenza” by FederManager, a prestigious prize to a leadership supporting an environment that may encourage work-life balance. EUPATI (Patient’s Academy) Expert Patient. Father of a child with Duchenne muscular dystrophy, vice-chairman of Parent Project Onlus and expert patient certified by the European Patient’s Academy on Therapeutic Innovation (EUPATI). Gerry Melino teaches Biochemistry and is Director of the Experimental Medicine and Surgery Department of the Faculty of Medicine and Surgery of the University of Rome Tor Vergata. He is also the director of the programme “Genes-Environment interactions following toxic insults” of the Medical Research Council, Toxicology Unit, University of Cambridge, UK. His scientific work is focused on cell death in tumour and dermatological models (H-index 95; 41780 citations); as for his publishing work, he is the editor in chief and founder of the scientific journals of the publishing group Sringer-Nature, Cell Death Discovery (www.nature.com/cddiscov), Cell Death Disease (www.nature.com/cddis) and Cell Death Differentiation (www.nature.com/cdd), which are considered the main discussion forum for the international community working on cell death. London, UK (since 2011). He is Research Director of the Economic Evaluation and HTA (EEHTA), at the CEIS of the University of Rome “Tor Vergata”. He is President Elect of SiHTA, Past President of the ISPOR Italy Rome Chapter; Member of the Regional Scientific Committee (Regione Lazio) on HIV and HCV (since 2011); Member of the IRG (Integrity Research Group), Kingston University, London, UK. He is professor of Health Economics and Political Economics at the University of Rome “Tor Vergata” (pre and post-graduate courses) (Faculty of Economics). He is coordinator of several projects for the Ministry of Health, INPS and INAIL. He is member of the working team on patient training with AIFA and EUPATI. in collaboration with leading NGOs. He is Chairman of the Scientific Committee of the European Conference on Health Economics (ECHE). better regional and corporate planning”, financed by the Ministry of Health, 2016-2017. Antonio Messina is the Managing Director and Chairman of Merck Serono S.p.A. He joined the company in April 1999 as Neurological Line Manager and in 2003 was appointed as Greece County Manager first and as Greece and Italy General Manager later. Before joining Merck, A. Messina held several offices in Bayer and Rhone Poulenc Rorer. In the latter company, he worked as Oncology Product Manager for the UK at first and, later, as Marketing Manager of the same line for the Italian structure. Since 2014, he is member of the Farmindustria Executive Committee. He graduated in Biology from the University “La Sapienza” of Rome and completed his education with an MBA course of “Strategic Executive Program” at the Babson College of Boston, a course of Finance for Executive at the INSEAD of Milan and Biopharma Breakthrough 2008 at the London Business School. In 2016, the University of Bari conferred him an honorary degree in Chemicals and Pharmaceutical Technologies. May-Britt Moser is a Swedish psychologist and neuroscientist who works as Department Director at the Centre for Neural Computation of the Norwegian University of Science and Technology (NTNU). She won the Nobel Prize for medicine in 2014, together with John O’Keefe and Edvard Moser, for the discovery of how the brain records and remembers space localization. Lorenzo Moretta, past-President of the Eur. Fed of Immunol. Soc. (EFIS), is member of the Accademia dei Lincei. He is at the head of the Immunology Unit at the Ospedale Bambino Gesù (Rome). He is one of the most known researchers, with over 61,000 quotations and an H-index of 130. His research activity is focused on cells of innate immunity and the treatment of high-risk leukaemia. Stefano Nava is Full Professor at the University of Bologna, Director of the Pneumology and Respiratory Intensive Care at Ospedale Sant’Orsola-Malpighi of Bologna and specialist in respiratory diseases, anaesthesiology and resuscitation. Short-term lecturer at Scuola di Specialità Malattie Apparato Respiratorio of the University of Pavia, Catania and Bologna and of Anaesthesiology and Resuscitation at the University of Pavia. Author of about 250 publications, 156 of which in journals indexed with the “peer-review” system, and 12 book chapters in foreign languages. Publisher of a book in English and two books in Italian. He is reviewer of several international journals and member of the “Faculty of 1000 of Medicine” since 2005, as well as member of the Top 100 Italian Scientists, ranking 34th in Clinical Science. Luca Pani is professor in Clinical Psychiatry at the University of Miami (USA), where he lives. In the last years, he has held important national and international positions as regulator and negotiator of new medicinal products, among which the first gene therapies in the world. He was the General Director of the Italian Medicines Agency (AIFA) from 2011 to 2016 and a member of the Scientific Committees of the European Medicines Agency (EMA) in London from 2010 to 2017. His most recent books on the subject include: Innovazione Sostenibile (EDRA, Milano 2015)*, Prescrivere Valore (con G. Corbellini, EDRA-LSWR, Milano 2017) and Resilienza Farmaceutica. Come Governare l’evoluzione delle terapie (EDRA, Milano 2018). Raffaella Pannuti, born in Bologna in 1973, has a degree in Industrial Chemistry. After several work experiences abroad and after obtaining a press card, in 1998 she joined ANT, today Fondazione ANT Italia Onlus, at first as Press Office Manager and then as Director in 2011. She is co-author of more than 20 papers on palliative care. She has been a speaker in several international and national medical and Third Sector conferences. She is a member of EUCLID, international associations of Third Sector leaders, and the European Union Action Groups. Carlo Patrono teaches Pharmacology at the Degree Course in Medicine and Surgery (Università Cattolica of Rome), and he is Adjunct Professor of Pharmacology at the Perelman School of Medicine of the University of Pennsylvania (Philadelphia). He is co-author of 230 scientific articles, with over 50,000 quotations. He was awarded the Grand Prix Scientifique Lefoulon-Delalande 2013 by the Institut de France for his research about low-dose aspirin as antithrombotic medication. He is a member of the Accademia Nazionale dei Lincei. Susi Pelotti is Professor of Forensic Medicine at the University of Bologna. She is technical consultant and expert of judicial authority, and since January 2015 she is President of the Italian Forensis Genetist. David Pettener is full professor of Anthropology at the University of Bologna since 2001 and member of the Science Academy of Bologna since 2010. His scientific work, in collaboration with Italian and international research laboratories and supported also by ERC projects, is focused on the analysis of interactions between the biodemographic structure and the genetic-molecular variability of human populations, with particular reference to the study of the genetic history of Italians and ethnic-linguistic minorities. Gianluca Petrella is a trombonist, composer and music producer. He was the winner of the “Down Beat Critics Poll” award as best rising jazz star. He collaborates with the best international musicians: Steve Swallow, Carla Bley, Steve Coleman, Lester Bowie, Pat Metheny, Enrico Rava, Roberto Gatto, Stefano Bollani and Paolo Fresu. He regularly participates in the most important Festivals around the world. He is very active also in electronic and pop music, collaborating with Nicola Conte, Dj Ralf and Lorenzo Jovanotti. Pietro Pietrini, neuroscientist and psychiatrist, is Full Professor of Clinical Biochemistry and Clinical Molecular Biology and, since November 2015, Head of the Scuola IMT Alti Studi of Lucca. He graduated in Medicine and Surgery and specialized in Neurosciences from the Scuola Superiore Sant’Anna of Pisa. For almost thirty years, he has been studying the brain basis of mental functions and normal and pathologic human behaviour, as well as the implications of neuroscientific knowledge on issues such as chargeability and free will. He is authors of several scientific publications and collaborates with the Sunday supplement of Il Sole 24Ore on psychiatry topics. Stefano Aldo Pileri is Professore Alma Mater (PAM) of Pathological Anatomy at the University of Bologna and Director of the Unità di Diagnosi Emolinfopatologica at the Istituto Europeo di Oncologia (Milan). He wrote over 1113 publications and he is co-author of the Classification of the blood and lymphatic system tumours on behalf of the World Health Organization. He dedicates his own research activity to the translational issues (from the laboratory to the patient’s bed) and to the personalized therapy in the field of lymphoma and leukaemia. Sergio Pistoi is a scientific journalist and advisor with experience as biochemical researcher. He took a PhD in Molecular Biology from the Institut Pasteur of Paris. He worked at the Scientific American desk in New York and as stringer for Reuters Health. He collaborated with Panorama, Corriere della Sera, Le Scienze and international journals, including Nature and New Scientist. He was in charge of Telethon scientific popularization until 2010 and carries out communication activities for European projects and research organizations. He is the author of the book “Il DNA incontra Facebook” (Marsilio Editori, 2012), winner of the Galileo literary prize. Giuseppe Plazzi is Associate Professor of Neurology at the University of Bologna and Head of the Centro per lo Studio e la Cura dei Disturbi del Sonno of the same university and the IRCCS of Neurological Sciences of Bologna. His main research and clinical field is represented by hypersomnia, especially narcolepsy. He is the author of over 280 scientific papers published in international journals, several book chapters and the first book on parasomnias published by an international publishing house. Patrizia Popoli, physician, heads the National Center for Preclinical and Clinical Evaluation and Research of Drugs at the itaian ISS (Higher Institute of Health). During her career she has always combined the activity in experimental pharmacology (publishing numerous scientific papers in international magazines) with institutional activity in the fields of clinical trials and drug evaluation. Since 2015 she is President of the Scientific-Technical Commission of the Italian Drug Agency (AIFA). Eleonora Porcu is Associate Professor of Gynaecology and Obstetrics at the University of Bologna, and Responsible of the Struttura Semplice di Infertilità e Procreazione Medicalmente Assistita at the general hospital S. Orsola-Malpighi of Bologna. She is author of 215 international publications and 179 national publications. Professor Claudio Rapezzi is Director of the Unità Complessa of Cardiology at the general hospital S. Orsola of Bologna and of the School of Cardiovascular System Diseases at the University of Bologna. His research focus mostly on: clinic cardiology, cardiovascular physiopathology, diagnostics, electrocardiography, cardiac insufficiency and myocardium diseases. He is author of over 500 publications on national and international reviews, books and conventions acts. Mario C. Raviglione is Full Professor of Global Health at the University of Milan, after being Director of the WHO Global TB Programme in Geneva from 2003 to 2017. He graduated from the University of Turin and specialized in internal medicine, infectious diseases and AIDS from the Cabrini Medical Center, New York and the Beth Israel Hospital, Harvard Medical School in Boston. With over 300 scientific papers, his H-index is 97. He is among the 10 most quoted authors in the field of tuberculosis and among the top 20 Italian Scientists in medical sciences. He has received several international awards for his works in the field of tuberculosis and global health. He has worked in over 50 countries and has been Visiting Professor and professor at several universities, including Johns Hopkins, Harvard, Mc Gill, Sydney, Geneva, Liverpool, Pavia, Modena and Reggio Emilia, and Brescia. Giuseppe Recchia graduated in Medicine and Surgery from the University of Padua, carried out research at the Renal Transplantation and Dialysis Centre of the Verona Hospital and, later, worked as Research Fellow at the State University of New York – Downstate Medical Center, NY. He is an expert in Pharmaceutical Medicine, Medical & Scientific Manager at GSK Italia, member of the Smith Kline Foundation Board and the Board of the Specialization School in Pharmaceutical Medicine of the University of Milan. Pierluigi Reschiglian is Full Professor of Analytical Chemistry at the University of Bologna. Since 2009, he is interested in turning academic research into business. He is the co-founder and owner of two spinoffs, one of which is Stem Sel® Srl, which invented and markets Celector®, the “chromatograph for cells”. Coordinator of the course “FROM IP MANAGEMENT TO TECHNOLOGY TRANSFER FOR BUSINESS” at the Scuola di Dottorato in Chimica of the University, co-examiner at the Scuola di Economia, Management e Statistica of the University during the discussion of some graduations theses on issues related to corporate financing, governance and MKT of spinoffs, in 2017 he submitted with ALMA EClub colleagues a case study for an innovative tool for the financial support of the proof-of-concept stage of business projects of academic origin. Luigi Ripamonti, physician and scientific journalist for Corriere della Sera, is the director of Corriere Salute (the Corriere della Sera weekly pages on health) and of the section Salute of Corriere.it. A specialist in Chemotherapy, he has worked as researcher at the Pharmacology department of the University of Milan, held a course of scientific journalism at the University of Milan for several years and collaborated with George Mason University (Virginia) and Chapman University (California) George Mason University in the field of Health Communication. Marco Roccetti is Full Professor in Bologna, where he coordinates the Data Science and Computation Doctorate, with PoliMi and Fondazione Golinelli. 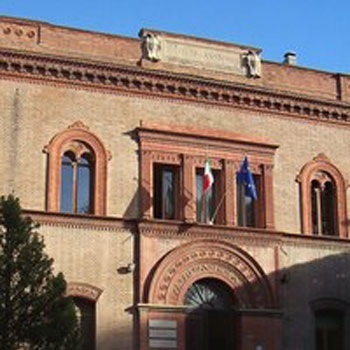 Associate Dean for Digital at the Bologna Business School. Visiting Scientist at UCLA. Sergio Romagnani is Professor Emeritus in Internal Medicine at the University of Florence. He is author of over 500 scientific publications with a global impact factor higher than 2,000 and over 50,000 quotations (source Google Scholar). He has been Chairman of the Società Italiana di Immunologia, Immunologia Clinica ed Allergologia, Chairman of the European Federation of Immunological Societies as well as member of the Council and Chairman of the Clinical Immunology Committee of the International Union of Immunological Societies. In 2005, he was awarded the title of High Official of the Order of Merit by the President of the Italian Republic for his contribution to the prestige of the Italian science in the world. Sara Roversi was born on 10 March 1980 in Bologna. She is a serial and passionate entrepreneur interested in food, digital, social innovation and creative learning. In 2004, she established You Can Group, today an entrepreneurial ecosystem constantly supporting the establishment of new companies. While traveling between San Francisco and Bologna, she gave birth to the trust Future Food Institute, dreaming of leaving her children a better world. Since 2010, she is at the head of the Trade Fairs, Marketing and Communication Section and member of the governing council of Confindustria Emilia. In 2012, she was awarded the Bellisario Prize for young women entrepreneurs and the Giovani Imprenditori prize from the Chamber of Commerce of Bologna. Since 2013, she is member of the Young Entrepreneurs delegation of Confindustria at the G20 YEA SUMMIT. Since 2014, she is member of the Advisory Board of Contamination Lab in Faenza and of YouthStartup.com. Finally, together with Professor Matteo Vignoli, she gave birth to the international master “Food Innovation Program” with the mission of inspiring and developing a new generation of entrepreneurs and innovators in the food supply chain. Fabio Roversi-Monaco was Magnifico Rettore of the University of Bologna from 1985 to 2000 and currently is Professor Emeritus of Administrative Law at the same University. During his time as Magnifico Rettore, he conceived and drawn up the Magna Charta Universitatum, which was signed by over 400 Chancellors from all over the world on 18 September 1988 and, later, by 500 Chancellors more, and is the Founder and Honorary President of the Magna Charta Universitatum Observatory. Professor Roversi-Monaco promoted the “Bologna Process”, which found fulfilment with the meeting of twenty-nine European Ministers for Education in Bologna in 1999, aimed at launching new university courses and ensuring the quality comparability of education qualifications of the Countries involved and free circulation of European students and graduates. The meetings led to the drawing up of the “Bologna Declaration”, which was signed by 29 European Countries on 19 June 1999. He is member of the scientific committees of several scientific journals and founder and editor of the journal “Sanità Pubblica e Privata”. He held the office of President of the Fondazione Cassa di Risparmio of Bologna. He was also President of Banca IMI and currently hold the office of Vice-president. He is also Chairman and Managing Director of the Società Museo della Città di Bologna S.r.l. Maria Giulia Roversi Monaco is professor of Administrative Law at the Degree Course of Law and professor of Principles Of Law at the Degree Course of Business and Economics (Clabe) of the University of di Bologna. She is a Supreme Court attorney. Massimo Scaccabarozzi has been Chairman of Farmindustria since June 2011. Before, he held the office of Vice-chairman of Farmindustria and Chairman of the IAPG Group (Farmindustria member of American Companies in Italy) for 5 years. Since June 2011, he is member of the Board and is permanently invited to the meetings of the Confindustria Board of Governors. Since May 2015, he is member of the Confindustria General Council. Chairman of the Johnson & Johnson Foundation from 2001 to 2011, he was re-elected to the chair in 2013 and reconfirmed in 2017. In 2001, he joined Janssen Italia, where he held the office of General Manager at first and Managing Director later. In June 2017, Janssen Italia was awarded the “Le Fonti” award for the second year in a row as Excellence of the Year for innovation in the pharmaceutical industry. In June 2016, he won the CEO award of the Year 2015 for pharmaceutical innovation. On 25 March 2018, he was appointed as Collegiale Honoris Causa of the Nobile Collegio Chimico Farmacutico – Universitas Aromatariorum Urbis for his professional and social merits and became member of the Nobile Collegio Romano de’ Speziali. He is the frontman of “JC Band”, a rock band composed of Janssen Italia employees that has been performing at charity concerts for ten years. Full Professor of International and Comparative Agricultural Policy at the University of Bologna since 2000, Andrea Segrè teaches Circular Economics at the University of Trento (in double appointment since 2015). He studies and applies the basics of economic, circular and sustainable ecology. Deviser of Last Minute Market, spin-off of the University of Bologna, and of the campaign Spreco Zero, he is currently the chairman of the Edmund Mach Foundation of San Michele all’Adite (TN), the F.I.C.O. Foundation and the Centro Agrolimentare of Bologna. He has been given several awards, including the 2012 Premio Internazionale Pellegrino Artusi. He is author of several articles published in international and national journals. His last essay was published by Mondadori in 2017 with the title “Il gusto per le cose giuste. Lettera alla generazione Z”. Director of the Ginecologia e Fisiopatologia della Riproduzione operating unit at Policlinico S. Orsola-Malpighi of Bologna. Associate Professor of Obstetrics and Gynaecology at the University of Bologna. He works in the fields of gynaecological endoscopic surgery, endometriosis, uterus pathology and sterility. He is author of over 230 publications in the major scientific journals and several books. Eugenio Sidoli graduated in Economics and Business Administration from the University of Parma and joined Philip Morris International in 1993; he has held positions at HQ in Lausanne and its Branches in Serbia, Montenegro and Spain; he is Chairman and Managing Director of Philip Morris Italia since 2010. He is Vice-Chairman of the American Chamber of Commerce in Italy and the Comitato Attrazione Investimenti Esteri of Confindustria, as well as member of the Comitato di Indirizzo of the Bologna Business School and Council Member of the Istituzione Bologna Musei. Roberta Siliquini has been Full Professor of Hygiene at the University of Turin and Head of the Specialization School for Hygiene and Preventive Medicine since 2007. She has been Head of the Degree Course in Medicine and Surgery of the University of Turin since 2014 and Chairperson of the National Health Council, the first woman to hold this office since its establishment in 1845. She is a member of the Italian National Bioethics Committee and the Italian National Life Sciences and Biotechnology Committee of the Council of Ministers. She is a member of the National Board of the Italian Society of Hygiene, Preventive Medicine and Public Health and coordinator of the teaching board of the same institution since 2016. She is author of over 200 papers on topics related to public health and a member of the European Public Health Association (EUPHA) and the Italian Association of Medical Managers (SIMM). Alessandro Solbiati, composer and student with Franco Donatoni and Sandro Gorli, winner in the early 80’s of several national and international contests, whose work is played for over twenty years at the major European festivals. He has recorded several CDs and DVDs with Italian and European record companies. As for theatre, he began with “Il carro e i canti” from Puŝkin, (Trieste -Teatro Verdi, April 2009) and continued with “Leggenda” from Dostoevskij for the Teatro Regio of Turin, staged in September 2011 (conducted by G. Noseda, directed by S. Poda). A third work on Kandinski’s “yellow sound” was staged at the Teatro Comunale of Bologna in 2015 and was awarded the Abbiati Prize by music critics as the best first playing in Italy in 2015. Since 2013, he hosts a series of programmes for Radiotre with the title “Music lessons”. He teaches Composition since 1982 (at first at the Bologna Conservatoire and since 1995 at the Milano Conservatoire). He publishes for Casa Editrice Suvini Zerboni of Milan. Enzo Spisni is a researcher and directs the Laboratory of Traslational Physiology and Nutrition of the Department of Life, Geological and Environmental Sciences of the University of Bologna. He is member of the scientific committee of the 2nd level Master in Nutrition and Health Education of the University of Bologna. He is the scientific manager of the Proteomic Service of the Department of Life, Geological and Environmental Sciences. As associate professor, he teaches Nutrition Physiology for the Degree Course in Health Biology as well as in several modules within the 2nd level Master in Nutrition and Health Education of the University of Bologna. He is the managing director of the spin-off Targeting Gut Disease Srl, whose shareholder group includes the University of Bologna. Sergio Stefoni, Professor Emeritus of Nephrology at the University of Bologna, was Director of the Nephrology, Dialysis and Transplant Service at the S. Orsola Polyclinic, Dean of the Medical Faculty and President of the International Society of Artificial Organs. He is the author of over 500 publications. Luigi Stortoni has held the chair of Criminal law at the Faculty of Law of the University of Bologna since 2016, after teaching at the Universities of Macerata, Salerno and Trento. He wrote monographs and many essays in several areas of criminal law. He directed for many years the Scuola Superiore di Studi Giuridici at the University of Bologna, and he is the Chairman of the Association of Criminal Lawyers dedicated to Franco Briciola. He held courses of criminal law at Spanish and French Universities, and was a member of Ministerial Committees with the task of drawing up Penal Code drafts. He works as criminal lawyer. Emeritus Professor of Neurophysiology at the University of Turin. He was a researcher in Canberra and Chicago with the Nobel Prize John Eccles. He is Honorary Professor of Neurology at the Northwestern University of Chicago. He is a member of international Societies and Academies, like the Academia Europaea. National Academy of Sciences XL Medal in Physical and Natural Sciences and Premio Feltrinelli at the Accademia dei Lincei. Carlo Tacconi, mHealth Technologies’s CEO, received the Master’s Degree in Computer Science from University of Bologna in 2005. His main research activity is in the area of m-health and e-health, multisensory integration and sensory augmentation, rehabilitation engineering, functional evaluation of locomotor and cognitive function, information security. He was involved in FP6-SensAction‐AAL, FP7-SMILING, FARSEEING, JTI-CAMMI, H2020 PreventIT, POR-FESR Step-by-Step and Habitat. He is author of about 30 papers published on conference proceedings and international journals. Director of the Istituto di Scienza e Tecnologia dei Materiali Ceramici (Faenza), Anna Tampieri has 30 years of experience in materials science, biomimetic materials and devices for tissue regeneration. She is the author of 200 international publications and 20 book chapters and the inventor of 16 patents turned into products for bone regeneration. She is coordinator of 8 European projects and WP Leader in international and national projects. She is member of the “Piattaforma Tecnologica Europea della Nanomedicina”. She has organized symposiums, schools and conferences on biomaterials. She is senior affiliate member of the Houston Methodist Research Institute, (U.S.A). Associate Professor of Medical Sciences and Applied Biotechnology. Inventor and founder of the company FINCERAMICA SpA. Inventor of the company GreenBone Ortho Srl. Advisor for several chemical, biochemical and pharmaceutical companies (Johnson & Johnson, FINCERAMICA SpA, Menarini Pharma). Former scientific advisor of the Ministry of Economic Development and the French Ministry of Industrial Research since 2011. Her project is to convert wood into highly regenerative human bone. Her research “From Wood to Bone” was recognized by TIME Magazine as one of the most important 50 researches in 2009 (30th). She gained recognition also from the prestigious Massachusetts Institute of Technology Review as a “Smart & Disruptive Company”. Giulio Tononi studied medicine, specialized in psychiatry and took a PhD in neuroscience in Pisa. He has worked in New York, San Diego and Madison, Wisconsin, where he currently works in the field of consciousness and sleep, together with Chiara Cirelli. His publications in Italian include Galileo e il fotodiodo. Cervello, complessità e coscienza (Laterza 2003); PHI, Un viaggio dal cervello all’anima (Codice 2014). Silvia Varani, psycho-oncologist and psychotherapist, is the head of the Dipartimento Formazione e Aggiornamento Scientifico of Fondazione ANT Italia Onlus. Member of the Emilia-Romagna Board of the Italian Palliative Care Society and the Italian Psycho-Oncology Society, she is been working in the field of oncology for twenty years, both from a clinical point of view and by following studies published in national and international journals. Elena Veronesi was born in 1984 in Mirandola. Specialist Degree with honours in Life Science from the University of Modena and Reggio Emilia (2003-2008). Spinner Point scholarship (2009). Research Doctorate in Molecular and Regenerative Medicine, University of Modena and Reggio Emilia (2010-2012). Research grant at the Laboratory of Cell Biology and Advanced Cancer Therapies, Department of Child and Adult Medical and Surgical Sciences (University of Modena) (2010-2015). Fixed-term researcher at the University of Modena and Reggio Emilia, in charge of the laboratory of Advanced Microscopy and Cell Biology at the Tecnopolo “Mario Veronesi” in Mirandola. Elena has studied the biology of adult stem cells, the interaction with biomaterials for studies on bone regeneration and to develop predictive cell models for new medical devices. Pierluigi Viale is Full Professor of Infectious Diseases at the University of Bologna and Head of the OU of Infectious Diseases at the Policlinico S. Orsola Teaching Hospital. He is an expert in antimicrobial therapy, with particular reference to infectious risk and immunodepressed patients. Andrea Vico is a science writer and popularizer. His credits include TuttoScienze-La Stampa, Il Sole 24Ore e Le Scienze. He was a writer for TV (Hit Science, RaiTre) and radio programs. He designs and coordinates interactive exhibits (Experimenta, Torino, Muvita, Arenzano) and events for Science Festivals in Italy. He he a co-founder of ToScience, a cultural association to promote science in schools. He wrote the book Energia, dal fuoco all’elio” (Editoriale Scienza, 2012) and “L’incredibile viaggio di una buccia di banana” (ed Giralangolo). Claudio Viscoli, ESCMID Fellow, is Full Professor of Infectious Diseases at the University of Genoa and Director of the Infectious Diseases Unit of San Martino General Hospital of Genoa. He is Head of the Postgraduate School of Infectious and Tropical Diseases and Coordinator of the PhD School of Health Sciences of the University of Genoa (DISSAL). He has been Visiting Director at the Fred Hutchinson Cancer Research Center in Seattle, WA, USA, coordinator of several research groups of international scientific societies and member of the same societies (IDSA, ESCMID, ECIL). Currently, he is Chairman of SITA (Italian Society of Anti-Infective Therapy) and in 2018 he was awarded the Excellency Award by ESCMID. He is also advisor for EMA (European Medical Agency). He is author of about 400 publications in international journals (H-index: 55), as well as of several book chapters. Rocco Maurizio Zagari is Associate Professor of Gastroenterology at the Department of Medical and Surgical Sciences of the University of Bologna. From 2005 to 2009 he was Research Fellow at the University of Leeds, UK, Centre for Epidemiology and Biostatistics, where he took a Master of Science in Epidemiology and Biostatistics. His research activities deal with Helicobacter pylori infection and oesophagus, stomach and duodenum diseases. Professor of neurobiology at University College London. Among her main areas of research is the organization of the visual brain of primates. He will speak on the theme: “The horizons of neuroestetica”. The theatrical performance will lead students in a journey through the changes faced by the body in adolescence. Starting from the scientific explanation of some phenomena that are typical of this season of life, students will learn about and recognize their body and understand how to take care of it. Besides the physical changes, the performance will deal also with the emotional sensations that characterize adolescence, an age that is as complex as it is full of exciting new things. Upon reservation (send an email to festivaldellascienzamedica@genusbononiae.it). The event is aimed at explaining to the audience and young researches the complex taxonomy of open science and the cultural and political challenges raised by the open management of the procedures, results and uses of scientific research. The number of researchers forced to retract publications containing intentionally or unintentionally manipulated data seems to have increased in the last decades. What is the magnitude of this phenomenon and what we do to detect manipulations, prevent misconducts and protect the integrity of scientific research? Hippocampus is a beautiful seahorse-shaped brain structure that is necessary for encoding our daily life memories. In this talk, I will ask what type of information does the hippocampus receive to generate such memories? Memories for episodes include information about where the event happened, when it happened, and what happened. Brain structures are feeding the hippocampus with such information – information about space, about time, and about objects. I will show that there are specialized cells that signal where the animal is (place cells), which direction the animal is moving (head direction cells), cells that signal the metric layout of the environment (grid cells), and cells signaling the speed of the animal (speed cells). Other cells signal objects and the relation between the object and the animal. Finally, I will show how groups of cells are tagging events with a time signal – so that similar episodes can be separated in time. A medical case characterized by a strong bioethical problematic aspect will be submitted to the students by way of a basic script. The ending of the story will be left “open” on purpose, in order to serve as the starting step for a workshop on the complex scientific, philosophical, and moral issues connected to the case. The students will work in groups, with the support of some expert coordinators, and will thus become the key players of a debate on bioethics. Just like a real jury, they will be summoned to choose the ending that they deem to be the “fairest” one, and will explain their decision to their schoolmates. Innovation is the focus of an event that, following in Farmindustria’s wake at Festival della Scienza Medica, suggests a solid professional perspective to new generations. A report on the biotech medicine world and its job opportunities will open the initiative. It will be followed by an exploration, with the students, of biotechnology and genetics frontiers and developments (with rhythm and irony), also through a video and simulated “genetic testing”. A real cross-medium event that will involve the students and stimulate them to reflect upon their future. Last December, the Italian Parliament passed a law on informed consent and advance directives on treatment choice. Technically available choices to alleviate suffering in the final stages of life are many and may include giving up life by means of different methods. What is the new legal scenario in Italy? What has been resolved and what is still open? How the inviolable right to live combine with the fact that an obligation to live cannot exist, also in the light of consent and self-determination? To what extent is it possible to ask for a third party’s assistance when one is not able to put an end to their own life? Regenerative medicine based on the use of stem cells to reconstruct tissues takes up an important challenge, i.e. the development of advanced effective therapies for rare, genetic and degenerative diseases that are still incurable. It is an approach based on solid basic research on the biochemical, molecular and cellular mechanisms of these diseases and a combination of state-of-the-art technologies of cellular and genetic engineering applied to stem cells. Some results have been achieved also in Italy, with the development of new therapies for corneal burns, immunodeficiencies and epidermolysis bullosa. To the detriment of our Italian scientific excellence, there are still limitations to research freedom that affect the opportunities to study and use embryonic stem cells, already used abroad in several clinical trials, based on “pseudo-ethical” reasons that are scientifically groundless. Analysis, diagnosis, prognostic models and interventions: artificial intelligence stands out as one of the instruments that will lead innovation in many medical fields in the next decades. But how will the doctor-patient relationship be changed by the mediation of intelligent machines? Will be there any unexpected consequences or adverse effects? Technological progress adds new meanings to the concept of cure, requiring a new definition of the dialogue between machines and man. The human species has been using antibiotics as pharmaceuticals for a little over 70 years. Before 1945, people used to die of pneumonia, meningitis, tuberculosis, gastroenteritis and infected wounds, while today these causes of death are relatively rare. Antibiotics are indispensable in modern medicine, which often makes use of medicines that reduce our defences against infections. In particular, bacteria that are becoming antibiotic resistant are Enterococci, Staphylococci, Clostridium, Acinetobacter, Pseudomonas and Enterobacteria. The reason why we risk losing antibiotic effectiveness is mainly their overuse over the years, and when somebody overuses a remedy, this may stop functioning. A change in the use of antibiotics is crucial. Pharmacology lives in the future. Because it develops today therapies that, after a long path of studies, will cure people in ten years. And because it acts globally, adopting in advance innovation arising anywhere in the world. Even more in this historical phase, when biopharmaceutical innovation is developing over 7 thousand medicines, with an acceleration triggered by open innovation and increasing synergies with ICT companies that exploit Big Data. Very rapid changes that we need to anticipate in order to turn them into opportunities for companies and the society, with new organizational models for the industry and the National Healthcare Service. In 2008, Philip Morris International started a deep business transformation based on a strategy of development and strict scientific assessment of a portfolio of alternative products with potentially reduced risks compared to cigarette smoke, known as Reduced-Risk Products. The efforts made in technological innovation and research are the core of this transformation: the strategy is based on the acknowledgement that the innovative products may benefit public health by significantly affecting the physiopathological mechanisms of development of smoke-related diseases. Limb amputation not due to trauma is still not infrequent in the ageing population. Paradoxically, this age bracket turns out to be the most fragile, so much so that not more than a third can actively ambulate with a lower limb prosthetic. The disease that is the most frequent cause of it is diabetes, which is characterized by vasculopathy with occlusion of peripheral blood vessels that is so spread as to make revascularization difficult both by endovascular means and surgical peripheral bypass. There is a part of patients for which revascularization fails or the disease characteristics make it impossible: the so-called non-revascularizable limbs. For these patients a therapy has been developed with totipotent stem cells that can stimulate, by means of growth factors, the development of new vessels to make up for the chronical occlusion of peripheral arteries with new collateral circuits. Clinical experience, though still in the beginning, seems to show in the near future new possibilities of healing or prevention for millions of patients with peripheral arterial diseases and, in particular, for those with the complications of diabetes, a disease with an epidemiological prevalence of 5% in Europe and 25% in the Middle East. Scientific and technological advances in the field of prosthetics and robotics allow to improve the life quality of people with temporary or permanent disabilities. New natural materials with high compatibility with the body and the innovation and precision of robotic supports are revolutionizing the sector, starting from an increasingly reduced invasive character. All these topics will be presented by some companies that, thanks to innovation, are in the forefront of prosthetics and robotics in biomedicine. We are living in an age of extraordinary medical discoveries and our Country has all the conditions to compete on a global scale in one of the fields that will be fundamental for the future of our planet: Life Sciences. An ecosystem that allows to move from the scientific excellence of university research to the creation of value and allows the sector to fully express its potential is possible: some examples will be presented through the words of researchers who, thanks to AlmaCube, converted their research projects into Companies that are able to create value. For several decades, chemotherapy was based on protocols, i.e. rigid combinations of medicines to be used for all patients. A new era began with the introduction of immunochemotherapy, though the last 15 years saw the rising of personalized therapies thanks to tumour genotyping. This approach is commonly known as Precision Medicine and has the advantage of a rapid translation from laboratory experiment results to patients. The current and future frontier is represented by cell therapies, including the use of patient cells as real medicines or “living drugs”. Digital technology has revolutionized the world of pharmaceutical companies affecting their organization, production processes and, in particular, research and innovation models. Effects attributable to the changes in the field, where medicines combine with services and digital diagnostics and technology that are redefining the doctor/patient relationship. Companies will be increasingly “human centred”. This new paradigm of the work evolution requires a search for solutions aimed at training new professionals, especially within the robotics, physics and biomedical engineering supply chain. A difficult but unmissable challenge for pharmaceutical companies, which today are increasingly proposing themselves as partners of players in health processes for the search of innovative solutions that go beyond medicines. The approval of a drug may require from 9 to 16 years after the identification of the active substance that is considered of potential therapeutic interest. The relevant cost ranges from $ 900 million to $ 1.8 billion, on average. The longest and most expensive steps of developing a drug are basic research and clinical trials. Why are costs so high? How will technological innovations change timing and costs for approving new drugs? How do requests to reduce or modulate in a different way the mark-up by regulatory agencies make sense? It is estimated that 25% of Italians take part in Internet communities/blogs/chats focused on food. This flow of information affects food choices and, therefore, health through detrimental and groundless behaviours. Fake news or real lies are rampant and false experts proliferate and create confusion and meaningless alarms to the damage of consumers: not only to the detriment of public health, but also with a negative impact on the Italian agri-food sector business. Red meat, palm oil, Fipronil in eggs, etc. A series of not very reliable cases spread by prestigious newspapers and unscrupulous web sites will be presented. The problem has always existed. The new thing is that the truth can be restored only in very few cases. But it would be sufficient to distrust excessive headlines and consult institutional and qualified sites only. The health-disease paradigm used for centuries to explain human pathology is correct for communicable diseases, which are unifactorial and in which the concepts of prevention (not getting in touch with the causal agent) and treatment (eliminating the causal agent) are clear. Nowadays the main health problem is no communicable chronic diseases and this is a different model, these diseases are multifactorial and they are more a process than a series of events and they are asymptomatic for long periods of time. Due to the epidemiological transition, there should be a conceptual transition that has not happened. “EXPERT PATIENT AND PATIENT ENGAGEMENT”. HOW IS THE PATIENT’S ROLE EVOLVING IN PHARMACEUTICAL RESEARCH? The patient’s role, regarded for a long time as a mere object of pharmaceutical research and development, is now evolving to become a new player in pharmaceutical research. The patient’s involvement may occur in different ways. The first model is represented by the creation of networks of patients that autonomously carry out their own research programs by sharing their clinical data, for instance PatientLikeMe. A second way is represented by the input that a patient may give to corporate or academic research, by giving indications and advises on aspects related to the pharmaceutical development process. In order for this second way to be qualified, it is essential that the patient is an “expert”, i.e. with both experience and expertise in the disease. Cancer patients suffer from physical and psychological symptoms that affect both the quality of life and, sometimes, the course of the illness. New technologies, such as immersive reality, combined with standard drug therapies, may represent a significant source of relief for home patients, helping them fight against pain and stress. Today, proton pump inhibitors, also known as “gastro-protectants”, are among the most used medicines to prevent or cure different oesophagus and stomach diseases. However, these medicines are often abused, with an inevitable negative impact on health costs. Recent studies show possible side effects related to their long-term chronic use. There were three million cancer sufferers in Italy in 2015, with epidemiological dynamics of prevalence increase and growing cost per patient dynamics that represent a problem of great impact on the National Healthcare Service management, even more if compared to the substantially flat trend of the national GDP. Innovative solutions must be found that combine efficiency in treating all patients and efficiency improvement in allocating resources to expenditure on healthcare. In this context, the IRST of Meldola considers strategic the development of health management and organization models that are functional to the continuity and quality of prevention, diagnosis and treatment paths and developed an effective and scalable methodology that is able to monitor the performance of an oncological journey both in terms of clinical results, suitability, equity and accessibility and in terms of resources used, in other words what is measures is the oncological “value” for the reference population. A short theatrical performance will stage a medical case characterized by relevant bioethical issues. The ending will be left open as the starting point for a reflection on the complex scientific, philosophical and moral questions raised by the case. The performance will be followed by a speech by Professor Luigi Bolondi (University of Bologna) on fake news in the medical field and a debate with the audience. The benefits of cold were already appreciated thousands of years ago. The Egyptians before and Hippocrates later noticed the analgesic anti-inflammatory properties of cold. In the last 200 years, cold has been used in many fields of medicine, from hypothermia for neurologic protection to cryosurgery and cryopreservation of somatic and gametic cells, embryos, organs and tissues. And finally, the science-fiction challenge of cryonics. In 1847, Metternich said that Italy is a geographical expression. Is Italian genetics influenced by geography? The genomic history of Italians, which is characterized by one of the highest levels of heterogeneity, is the result not only of its complex demographic history but also of evolution mechanisms of adaptation to the environment and the consequent different susceptibility to diseases. WHAT WILL BE THE COSTS OF PRECISION MEDICINE? After about 10 years of gestation and 10 years of claims, Precision Medicine has recently changed its pace and entered a new era. Thanks to molecular and gene bioengineering, which directly changes our DNA, today we see the first clinical experimentations of CRISPR (Clustered Regularly Interspaced Short Palindromic Repeats)-Cas and CAR-T (Chimeric Antigen Receptor – T). We will have to wait for clinical practice to confirm hope in the duration of the effect of these therapies, but there is no doubt that it is very high precision and cost medicine. The challenge is to find methods that are innovative enough to reimburse them. Seven transmembrane receptors (7TMRs), also known as G protein coupled receptors (GPCRs) represent by far the largest, most versatile, and most ubiquitous of the several families of plasma membrane receptors. They regulate virtually all known physiological processes in humans. As recently as 40-50 years ago, the very existence of cellular receptors for drugs and hormones was highly controversial, and there was essentially no direct means of studying these putative molecules. Today, the family of GPCRs is known to number approximately 1,000, and crystal structures have recently been solved for dozens of the members of the family and even of a receptor-G protein complex. I will briefly review how the field has evolved over the past 50 years, hanging some of the story on my own research. Then I will discuss recent developments in the field, which are changing in fundamental ways our concepts of how the receptors function and are regulated. These include the duality of signaling through G-proteins and β-arrestins; the development of “biased ligands”; and the possibility of leveraging this new mechanistic and molecular information to develop new classes of therapeutic agents. Finally, I will discuss recent biophysical and structural studies of receptor-β-arrestin interactions. Cranial dysmorphisms (commonly, plagiocephalies) in infants are much more common that is thought; plagiocephaly alone affects almost 50% of infants. In some cases (15-20%), consequences may be serious and, therefore, it is necessary to determine the type of deformity and its cause. How to scientifically recognize and assess the different types of dysmorphism, treatment timing and methods? Although there are no shared guidelines for the treatment of cranial deformities, the aim is to establish an optimum pathway based on the experience on 1000 monitored and treated children, with a multidisciplinary view involving. paediatric neurosurgeons, infantile neuropsychiatrists, physiatrists, neonatologists, paediatricians and, for the instrumental part, biomedical engineers. The doctor-patient relationship is characterized by the so-called information asymmetries, which influence also decisions, especially the physician’s ones. These decisions sometimes include mechanisms that may generate some of the major errors of assessment. It is possible to identify these mechanisms and explain how to prevent or mitigate the errors. Hic mors gaudet succurrere vitae Hic mors gaudet succurrere vitae (Here death is happy to help life): an ancient concept rewrites a new chapter on modern frontiers of scientific research and medical training. 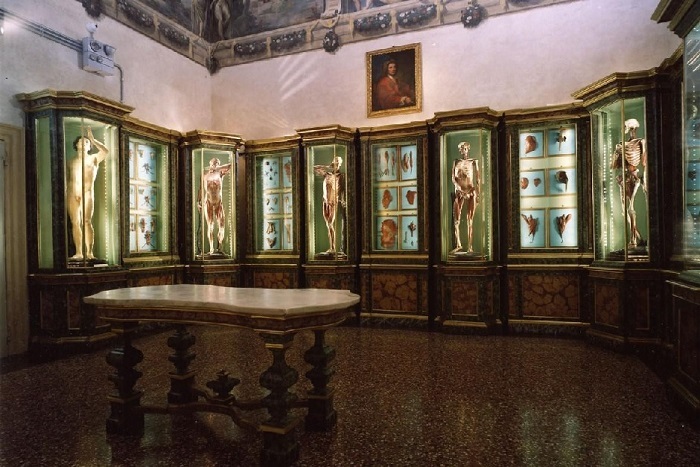 The Festival della Scienza Medica will give us the opportunity to run through the evolution of the sector practice, from the Biblioteca and the Museo delle Cere Anatomiche L. Cattaneo to the Sala Anatomica G. Mazzotti with demonstrations on corpses”. Talking about health guidelines means making reference to tools that, included in the “time of treatment”, are aimed at improving treatment quality and offering benefits to patients and physicians as well as, more generally, to public health. The reference included in the recent law on professional liability is the starting point for a critical reflection on the application of health practice guidelines and professional legal aspects in current reality. Brain injuries (tumours, strokes) often affect the perception of time. This confirms that the perception of time, where we experience the world and our interiority, is a real event of nervous mechanisms. They process time electrochemical information that reaches the centre of consciousness. The discovery of the perception of time is a key event in the history of science and ideas. THE NEUROIMAGES ARE PHOTOGRAPHS OF OUR THOUGHTS? Few techniques have stimulated imagination more than functional magnetic resonance imaging (fMRI), which has been used in newspapers for years to explain several different brain functions. What is fMRI? How was it discovered? Where do these coloured stains that fascinate us and are spoken about so much originate from? Is it all that simple? An opportunity to display the limits and benefits of a technique that has revolutionized neurosciences. Care for the terminally ill is a fundamental responsibility of a civil society. In the case of children, the increase in cases, related also to changes in social dynamics, requires a more effective organization of services and referrals. In front of the complexity and duration of such a serious situation in children, the several interventions supporting care and relief are aimed at ensuring balance and a good quality of live to the whole family. The meeting will deal with the development of Paediatric Palliative Care by giving an international overview and highlighting responses to the needs in each stage, place and context. Sleeping is a universal phenomenon, strictly regulated, and we all can appreciate the refreshing value of a goods sleep. However, the reasons why sleep is so essential for the functioning of our brain is still a mystery. The hypothesis of “synaptic homeostasis” claims that sleep is the price to be paid for allowing our brain to learn new things, strengthen major memories and forget unimportant stuff. The concept of plasma cholesterol “normal value” has radically changed in the last years. In particular, Researchers and Clinicians are increasingly focusing on the LDL fraction; moreover, it has been proved that there is not one “normal value” but different “desirable values” of cholesterol, depending on the characteristics of individuals and their general risk profile. In the last years, the treatment of dyslipidaemia and, in particular, hypercholesterolemia has been enriched with new medicines and strategies. THE TREATMENT OF HYPERCHOLESTEROLEMIA: WHEN IS IT NECESSARY TO HURRY UP? As for hypercholesterolemia, doctors and patients have at their disposal a wide range of therapeutic instruments that includes both food supplements and real medicines (fibrates, cholesterol absorption inhibitors, statins, monoclonal antibodies against some components of the LDL-cholesterol receptor). The use of medicines of proven effectiveness in rapidly reducing the LDL cholesterol value is particularly important in patients who had suffered acute myocardial infarction (treated with coronary stents, if it is the case), in which much of the residual risk lies in the months immediately following the first episode. Allergic diseases are a significant health and social problem due to their high frequency in the population and, as for anaphylactic shock (fortunately rarer) also due to seriousness. We are talking about: atopic dermatitis, allergic rhino-conjunctivitis, allergic bronchial asthma, gastrointestinal allergies and anaphylactic shock. Consequence of an anomalous response of the immune system to elements such as pollens, house dust mites, epidermic derivatives of pets, some foods and drugs, which are normally harmless for most people, these allergic diseases are caused by a combination of genetic and environmental factors that may trigger a local or even systemic inflammatory reaction. Allergic diseases have notably increased in the last decades, most probably because of the improved hygiene conditions that have led to a reduction in the microbial load in the fetal and neonatal period and, therefore, caused a change in the immune system response modes. Global health is an area of study and intervention that, through transnational cooperation and multi-sectoral action on factors causing diseases, aims at improving health and obtaining equity in access to prevention and treatment for the whole world population. Thanks to the estimate of the global burden of diseases and the analysis of risk factors and socio-economic determinants, the search for solutions shall be based on scientific evidence and focused on interventions that are necessary especially for the most vulnerable people and populations. Following epidemiological transition, in many countries the burden of infectious diseases has been progressively decreasing, though quite slowly in poor countries, especially in Africa, in favour of non-communicable diseases, related to risk factors such as smoking, alcohol, physical inactivity and improper diets, and car accidents. Future projections show that this trend will continue, requiring a change in national and international mechanisms that operate in the field of health. The complex phenomenon summarily called globalization is radically and actively changing the way things go, modifying relationships between the epistemological and cognitive models inherited from modernity and challenging their effectiveness. It is the case of the space and place relationship, which sees the latter reverse its subordination to the first, a relationship that has characterized the whole modern age. And the best definition of place is “a field of care”, the field where the modern dichotomy between subject and object tends to disappear. “We are what we eat” said the philosopher Ludwig Feuerbach, but lately the opposite seems more common: “We are what we do not eat”. An increasing number of people define themselves based on what they remove from diet: lactose, gluten, products of animal origin, all sugars, or white ones only and so on. We will see how in many cases these exclusions do not have any scientific basis. Two events dedicated to families. Children and their parents are invited to take part to an “anatomical lesson” in the suggestive Anatomical Theatre of the Archiginnasio. A show where professional entertainers will tell the wonders of the human body in a funny and engaging way. Together with drinkable water, vaccines were and still are the most effective tool of prevention for infectious diseases. It does not make any sense to question whether they are effective, useful and safe or not. It does make sense to reflect upon the reasons why some people deceive themselves to such an extent that they get organized or campaign for reducing their use, it does make sense to reflect upon the best strategy to obtain a safety coverage for the different infectious diseases and, finally, it does make sense to reflect upon the best strategies to neutralize the circulation of dangerous nonsense on the risks and uselessness of vaccinating ourselves and our children. A new publishing project meets medical research. The digital publishing platform BUP DPS allows all Research Societies and their members to have immediate access to a publishing solution designed to meet the highest international standards: a fundamental instrument for the validation, diffusion and popularization of medical research. The rapid increase in life expectancy due to developments in science in the last decades has allowed more Western women to live more than thirty years of their life in menopause. What happens in the body of these women in this long period? Is it true that all of them have to face annoying situations and symptoms or do some women live this transition age with serenity and without major issues? Do women’s clinical events and diseases after menopause are the same as men’s ones? Is it useful to think of genre medicine? An hour of storytelling that, through film clips, interviews, and interventions of experts will allow to acknowledge less known aspects, different suggestions and characteristics, including positive ones, that this long and wonderful period of the life of women hides. In Italy, there are 2,200,000 adults with Chronic Kidney Disease (CKD), of which 800,000 with a significant level of dysfunction. It is a serious disease for its significant extrarenal complications, which are often present from the very beginning and accompany the patient even for 10-15 years and, in particular, throughout the natural course of the disease that, at the best of times, evolves until dialysis, which is disabling and with high costs for the community (dialysis expense amounts to Euro 2.4 billion/year in spite of the fact that dialysed patients represent only 0.08% of the general population), if not until the patient’s death. CKD can be prevented and treated thanks to a healthy lifestyle aimed at reducing the onset of hypertension, diabetes and obesity and only few (and simple) “nephrology” checks can allow early diagnosis. The timeliness of implementing therapeutic strategies allows to improve the patient’s survival, renal function and life quality, as well as to save the (already limited) economic and human resources for public health. The lecture dwells upon the technology-driven evolution from the Industrial to the Post-Information Society, with drastic transformations in our way of living, starting from the job market and then pervading all aspects at both individual and social levels. Great opportunities will come together with unprecedented challenges to living as we have always known it. In this innovation-filled scenario, it is argued that human creativity becomes the distinctive ability to provide dignity at first and survival in the long term. The term organic creativity is introduced to indicate those conditions, attitudes, and actions that bear the potential to be at the same time productive in socio-economic terms and conducive to human well-being and happiness. Acetylsalicylic acid (ASA) is an example of a molecule that is still largely used in spite of the over 120 years passed since its chemical synthesis. Evidence of the therapeutic use of salicylates dates back to the times of the ancient Egyptians. It is a story full of discoveries culminated with the Nobel Prize to Sir John R.Vane. Today ASA is one of the most studied active substances and the topic of many publications in high scientific level journals. The pharmacological effect of acetylsalicylic acid (ASA) that has success and attention in modern times is certainly its positive interaction with the risk and prognosis of cardiovascular diseases. Today, the vascular protection properties of ASA are significant also in patients who undergo coronary angioplasty with the introduction of stent, which represent the reference treatment for acute coronary syndrome patients and whose effectiveness over time depends on the basic action of this active substance, which has been proved to be effective in a wide population. The experience of beauty, whether derived from sensory sources such as visual art or music, from moral sources or or from highly cognitive ones such as mathematics, correlates with activity in the same part of the emotional brain, field A1 of medial orbito-frontal cortex (mOFC). Moreover, the intensity of activity there during aesthetic experiences is directly related to the declared intensity of the aesthetic emotion. This raises important questions about the role and uses of beauty, not only in our daily experience but also in our efforts to understand the structure of the Universe in which our brains have evolved, through the experienced beauty of mathematical formulations. bout 30,000 times a day, we unconsciously choose behaviours that open to one of the infinite possible futures before us. We act automatically, led by mental programs based on our experiences and convictions that we do not normally question. “FLOW – The Latent Mind” talks about progresses in neurosciences that are making us understand how our brain works, always on the delicate balance between instinct and reason. While scientific and molecular medicine has made great progress in the diagnosis and treatment of many diseases, the time factor has been often neglected. Still, time counts in the doctor-patient relationship. The longer the time spent in listening to the patient, the higher the likelihood of success of a therapy. Because words are often as important as molecules. More than a century has passed since one of the founders of immunology and experimental oncology, Paul Ehrlich, invented the expression “magic bullets” for treatment strategies that use engineered molecules able to very selectively recognize a target causing a disease and neutralize it. Ehrlich’s model was represented by antibodies and today immunology, with a much wider range of biological and engineerable instruments placed at its disposal by the immune system, represents the frontier of the most advanced and promising fight against cancer. Men’s violence is the first unnatural cause of death of women in a large part of the world, including Europe, as shown by daily news. Killed women are just the tip of the iceberg of a phenomenon that includes a great number of brutal behaviours, such as physical aggression, segregation, sexual harassment, control of individual freedom, submission and real psychological and moral violence. A large part of violence against women occurs within the home, often leading to the tragic end of killing: a woman every three days in our Country. Half of these women are killed by their partner who, in some cases, does not spare their children’s life. How is it possible? How is it possible that the promise “to love and cherish you for the whole life” changes into what some have defined the women holocaust? The analysis of the conditions in which these unacceptable behaviours develop, the pathologies that affect the individual and often undermine the couple’s relationship since its beginning, is a first step to define effective educational and preventive strategies. Nuclear therapy is based on the use of “intelligent” radiopharmaceuticals (radioactive molecules) that are administered through different routes and selectively reach tumour cells. At that moment, a high dose of radiations is released with lethal effects on the tumour cells. The use of radiopharmaceuticals is increasingly preceded by a prior identification of specific tumour targets in the patient by using Positron Emission Tomography as a diagnostic tool. Nuclear therapy shows significant effectiveness and minimal side effects, therefore leading to an improved life quality. Therapies with radiopharmaceuticals are well established in the treatment of thyroid cancer, neuroendocrine tumours, lymphomas, prostate cancer and an increasing number of other fields, thanks to the availability of very promising and innovative radiopharmaceuticals. Consciousness is our private universe: people, objects and colours, sounds, pleasures, pains, thoughts and feelings – any possible experience. We know that consciousness depends on the brain, but how and why it happens is still an insoluble mystery. The theory of integrated information takes its cue from the essential properties of experience and derives properties that are necessary and sufficient for the consciousness physical substrate. The theory explains why some brain parts are important and other are not and why consciousness disappears during certain sleep stages, in spite of the fact that the neural activity is similar to that of waking. New methods inspired by the theory are opening possibilities to assess the consciousness degree of patients with brain injuries, during the development, and in species other than ours. One of the most significant and current implications of the theory is that calculators, in spite of their possibility to act in a way that is indistinguishable from humans and including to surpass our intelligence, will necessarily lack consciousness. Gustav Mahler suffered from rheumatic carditis, an inflammation of cardiac valves that may follow streptococcal infection. His heart emitted pathological murmurs that his wife Alma used to recognize even without stethoscope. His mitral valve was steno-insufficient, a condition that predisposes to bacterial endocarditis, which indeed was fatal to the musician, who died in 1911 at 51. Mahler’s weak heart can be heard in some musical passages, for example the first movement of his last finished symphony, the ninth. Paolo Fresu will show how heart rate can enter music. specialities involved in the treatment of cardiovascular diseases know very well that cure begins with prevention and, therefore, good dietary behaviour. The last 35 years has seen a sea change in the field of circadian rhythms. This molecular era began with work in Drosophila (fruit flies), which has been a leading genetic system for more than 100 years. My colleagues and I discovered the mechanism that underlies circadian timing, and it turns out that this mechanism is conserved in all animals. In other words, the progress made in fruit flies is directly relevant to humans. Moreover, the circadian clock governs a large fraction of all gene expression, once again in humans as well as fruit flies. This explains why such a large fraction of animal physiology (biochemistry, metabolism, endocrinology, behavior, sleep etc.) is under circadian control. The circadian clock runs within only 75 pairs of neurons in the fly brain; this is much simpler than the clock system in the mammalian brain and is facilitating our current work. It is focused on trying to understand the relationship between circadian function in the brain and sleep. My field has been largely supported by the US National Institutes of Health (NIH), which remains critical for underwriting the foundation of health-related research. Considered one of the most interesting buildings of the Bolognese Renaissance between the fifteenth and the sixteenth centuries, with its façade Palazzo Saraceni is an example of the encounter between the Bolognese tradition and the architectural novelties from Florence. Its rich terracotta decoration stands out alternating with the sandstone of the portico capitals. Antonio Saraceni’s residence in early sixteenth-century, its famous guests include two Veneto Ambassadors among Pope Julius II’s suite. In 1930, it was purchased by Cassa di Risparmio di Bologna, restored and refurnished in neo-Renaissance style. The grand staircase was decorated with grotesques by Roberto Franzoni, author also of the allegorical panels in the ceremonial hall of the main floor. The halls contain Bolognese seventeenth-century and eighteenth-century paintings belonging to the Foundation art and history collections. Among them, the series of finely framed eighteenth-century tempera paintings by the landscape painter Vincenzo Martinelli and the figure painter Nicola Bertuzzi stand out, which were once contained in the villa “La Sampiera” on the Bolognese hills. More recently, the building became the seat of the Fondazione Cassa di Risparmio in Bologna, which promoted a wide and complex restoration. Today, it is open to the public on the occasion of art exhibitions and cultural events on the ground floor. “The buildings’ destiny sometimes is like the one of men. They risk to be forgotten and to fall into an irreversible decay. 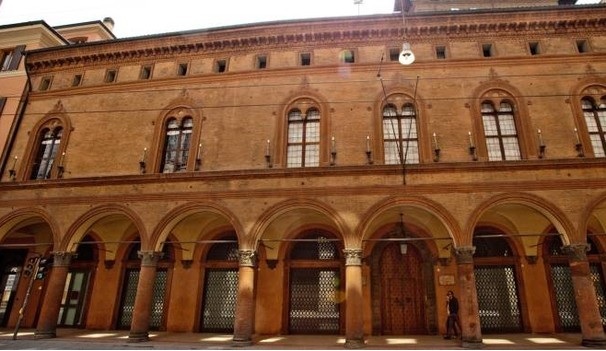 Palazzo Pepoli Vecchio was risking this fate but today it returns to shine and to show the great history of Bologna in a new and surprising way. This museum for the city was set up, like all my display works, respecting (and separating) the container and the content so that they mutually enhance beauty and meaning. At the centre of the Palace a glass and iron tower reinvents the courtyard so that it regains its dignity and function. It seems like a magic lantern flooded with natural light from above gradually descending into pure transparency. It is almost an epiphany that makes you reflect about the passing of time. Inaugurated in 2007, the Church of Santa Cristina was reopend to the public as a privileged venue for concerts, and each year offers, from October to May, unique musical events performed by exceptional performers. Inside the Church it is possible to admire the only 2 sculptures ever modeled by Guido Reni, representing Saints Pietro and Paolo. The artworks inside Santa Cristina represent a compendium of the Bolognese artistic school between the 16th and 18th century, culminating in the great Ascention by Ludovico Carracci, located on the main altar. The origin of the Church dates back to 1247, when the Camaldolese nuns moved their convent from Settefonti (near Ozzano) to Bologna. The Church we admire today was built in 1602 by Giulio della Torre, an architect that belonged to Domenico Tibaldi’s circle. Inside the Church, the peculiar narrowed presbitery transforms the structure of the Church into an architectural musical instrument, where the sound spreads out in such an impressive clear way. Right from this characteristic the myth of the “singing nuns” was born: in the room behind the apse the nuns used to sing without being seen and their voice, thanks to the two gratings on the main altar, spread throughout the Church up to the entrance. The Church was then closed and reopened various times during the Napoleonic era. After the Italian unification it became a military warehouse whereas the convent was turned into barracks. The former church of Santa Lucia, whose charmingly unfinished front stands halfway down Via Castiglione, was solemnly inaugurated in May 1988 on the occasion of the celebrations organized by former Rector Fabio Roversi-Monaco for the Ninth Centenary of the University of Bologna, who purchased and restored it for the University. 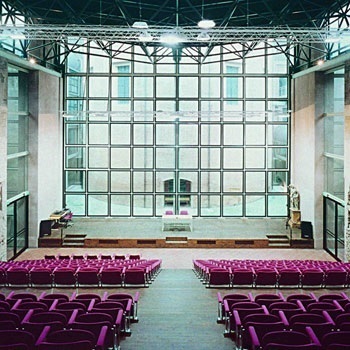 The building hosts the Aula Magna of the University in the central nave and the Aula Absidale, between the seventeenth-century apse and the nineteenth-century apse. Characterized by its imposing baroque spatiality, it was commissioned in 1623 by the Jesuits to the great architect Girolamo Rainaldi, who proposed the Chiesa del Gesù in Rome as a model. Works lasted for years and the building was completed only around mid-nineteenth century by the Barnabites. Neglected for decades, the church has been finally rehabilitated thanks to the University of Bologna, which promoted its restoration carried out by architect Roberto Scannavini according to the most modern and advanced architectural and technological standards, making it one of the most famous university great halls in the world. Palazzo Re Enzo was built in the 14th century immediately after the Palazzo del Podestà, and it was called originally New Palace to distinguish it from the latter; its function was new indeed, since it had to include the widespread representatives of the people. It became later the forced house of King Enzo of Sardinia, son of the Emperor Frederick II, who, captured during a war, was imprisoned there for 23 years, until his death. 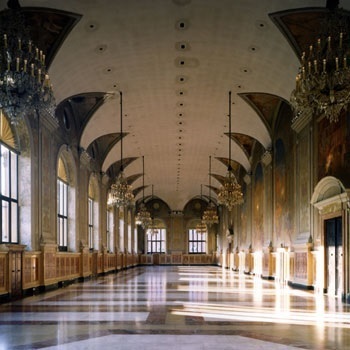 The Palazzo was rebuilt and restored several times, and it is one of the most important venues of the city. The crenelated profile of the building faces Nettuno Square and bears witness to the splendour of Bologna during the Middle Ages. Realized inside a 16th century church, the Art and History Library of San Giorgio in Poggiale has since 2009 housed the rich book patrimony of the Fondazione Cassa di Risparmio as well as important contemporary artworks: Campo dei Fiori and the monumental Delocazione by Claudio Parmiggiani, and the cycle Cattedrale by Piero Pizzi Cannella.The Library, whose lay-out was curated by the architect Michele de Lucchi, is also used as a venue for cultural events and exhibitions. The Church of San Giorgio in Poggiale, of ancient Longobard origin, was planned and realized between 1589 and 1633 by the architect Tommaso Martelli and then consigned to the priests of the Servite Order until 1798. The name of the Library derives from the street in which it is located (today via Nazario Sauro), known as via del Poggiale until 1919. In 1797, after the Napoleonic suppressions, the Church was assigned as subsidiary to the Chapel of Saints Gregorio and Siro. In 1882, the church was consigned to the Gesuits, that remained there until it was partially destroyed during an aerial bombardment on 25 September, 1943. After being deconsecrated and deprived of its artworks the Church was about to be demolished between 1959 and 1962. The building was then acquired by the Cassa di Risparmio in Bologna and after an accurate restoration it was destined as a home for its collections. Since 2009 the Church has hosted the Library that bears its name. 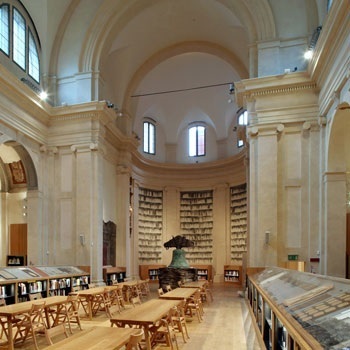 The Collection comprises 100.000 books, of which about 60.000 are part of archives, acquisitions, bequests or donations and it is mainly constituted by volumes about the local art and history. The archives listed in alphabetical order are: Ambrosini, Boschetto, Castagnetti, Grazia, Puzzarini, Sassoli e Silvani. At the end of the 1980’s, a further historical nucleus formed around 1837 (date of establishment of the Fondazione Cassa di Risparmio in Bologna) was added to the Collection, in which antique and modern texts are available. The newspaper and periodical Collection comprises various titles from the end of the XVIII century to present day: from the 18th century “Gazzetta di Bologna” and the 19th century “Il caffè di Petronio” right up to today’s newspapers and periodicals. The photographic Library contains about 60.000 items, articulated in different archives. The history of the photographic archive began in the first half of the last century, when the Curator of the Collections of the Cassa di Risparmio in Bologna realized the importance to acquire documents that could testify the urban transformation of Bologna after the actualization of the city planning act in 1889. The acquisition of Pietro Poppi’s archive, composed by approximatey 3.000 photo plates, dates back to 1940. The other archives, in alphabetical order, are the following: Fantini, Fototecnica Bolognese, Leonotti, Mengoli, Michelini, Romagnoli. Click here to read the articles of the Festival della Scienza Medica. Great success for the fourth edition of the Festival, dedicated to the “Time of care”: many citizens, even very young, doctors, and experts who ask for answers and reliable information. Against fake news it is increasingly important that science comes out of the labs to become alive, pulsating, engaging, a benefit of the whole community.